I have been missing my usual winter routine of several trips down east. Schedules have been busy, and this thing called work has a way of occupying a lot of your time! So, last week we decided to make a day-trip to my favorite spots in North Carolina – Pocosin Lakes and Mattamuskeet National Wildlife Refuges. I wrote about one of the highlights in a previous blog – the epic battle between heron and fish. This post covers the rest of that amazing day, starting with a rendezvous with our friend in Raleigh at 6:45 a.m. (admittedly, a rather leisurely hour for such a trip). We arrived at the Pungo Unit a little after 9. The skies were gray, the wind whipping, temperatures below freezing – a Pungo kind of day. This is the reason I often tell people to dress as if “you will be the coldest you have ever been”. To our surprise, the only birds in the fields behind the maintenance compound were a ton of American robins. 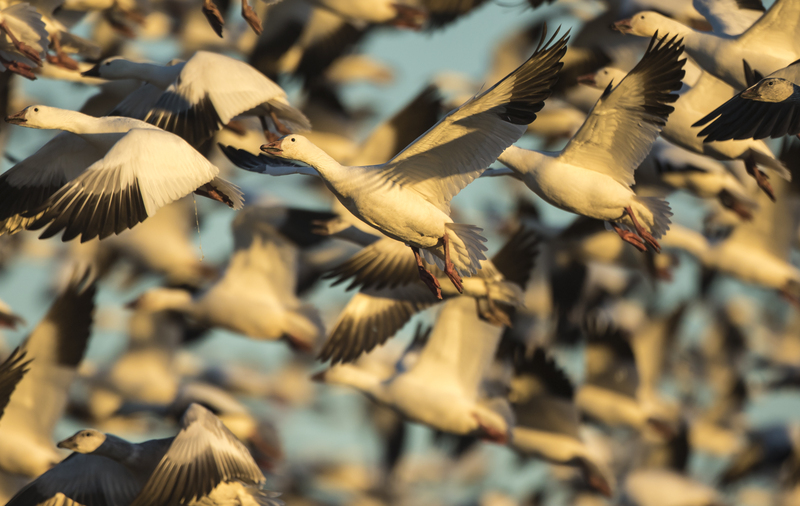 Friends had reported that large flock of snow geese had been feeding there in recent days, and it was the time of day when they are usually in the fields for breakfast. We drove on, spotting a couple of uncooperative river otter in a canal. Try as we might, we only managed quick glimpses before they totally disappeared. A quick stop at the blustery observation platform confirmed that the waterfowl know not to be out in the open on such a windy day. All we could see were some thin white lines of swans on the far shore where the forested shoreline provides them with some protection from the north wind. Sandhill cranes on the refuge! On to Marsh A, one of the managed wetland areas for waterfowl, and a favorite place of both swans and swan-watchers. 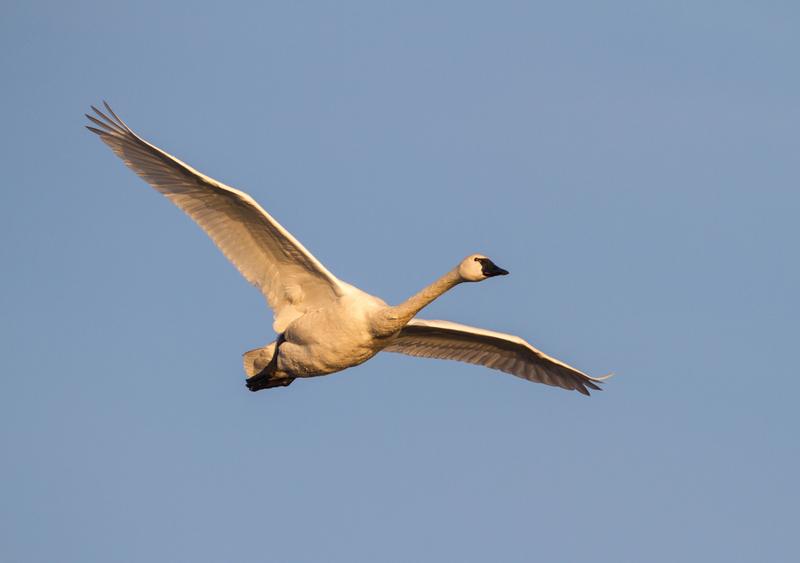 Indeed, there were a few thousand tundra swans milling about, some, on the fringes of the flock, walking on ice. 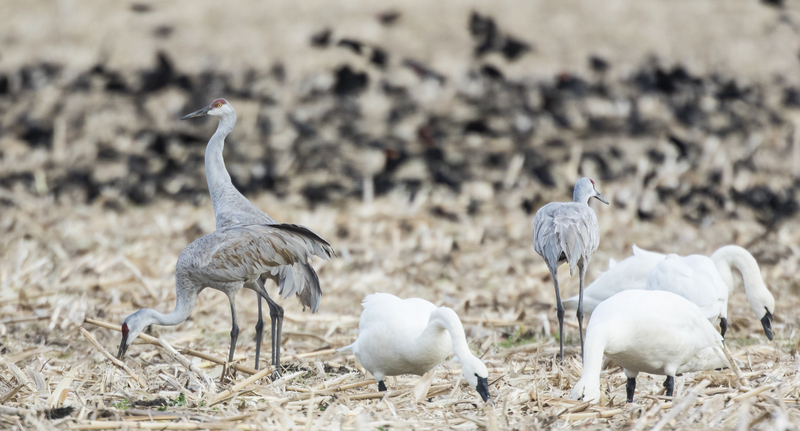 A quick glass of the area revealed a bonus – three sandhill cranes! 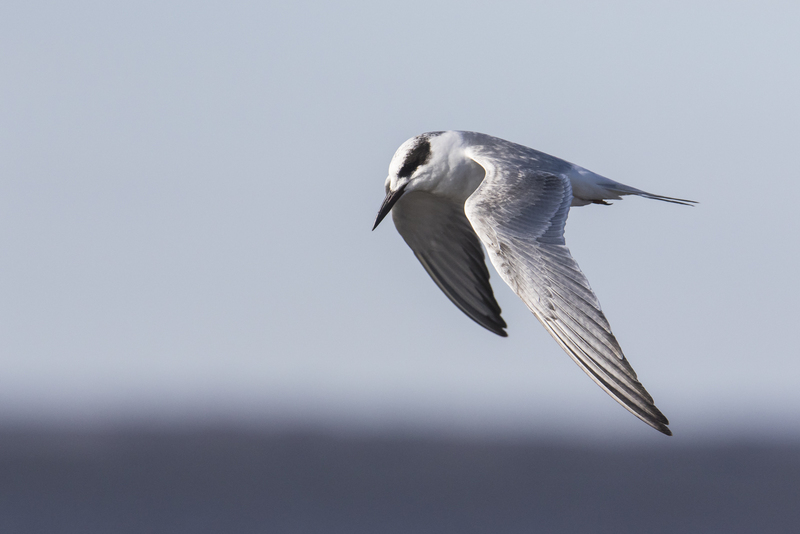 They were reported earlier in the season, but we had missed them on the Christmas Bird Count. I have seen this species here sporadically over the years, usually just as a fly-over. 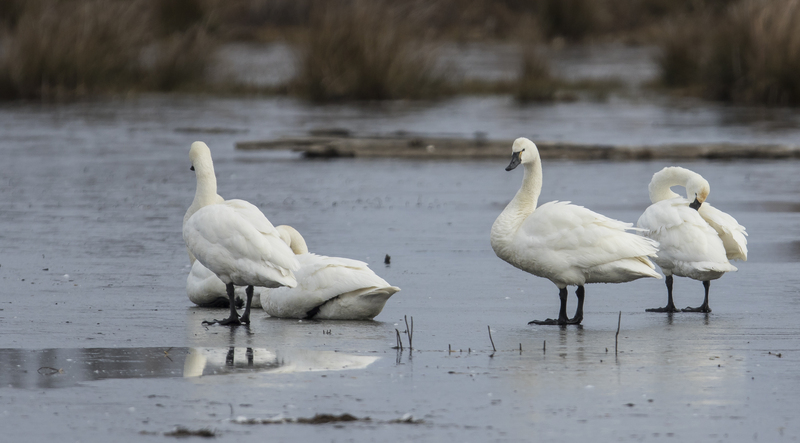 but these three were hunkered down in the marsh, no doubt wondering why they had not opted for a warmer habitat. 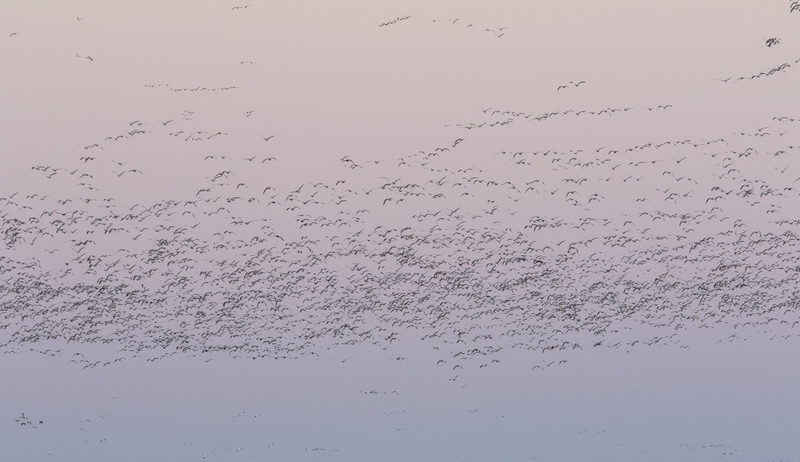 We then saw a giant flock of snow geese flying into the lake from the north. Had they been feeding in the fields along “Bear Road”? 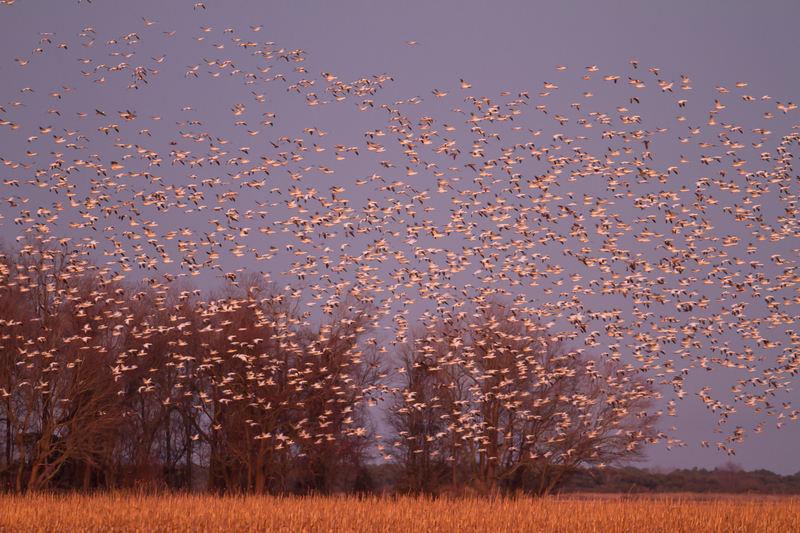 We drove over, hoping to see some stragglers and were greeted by a few hundred snow geese out in the corn. We encountered some other friends from Raleigh, shared a few stories, and then headed over to Mattamuskeet for the middle part of the day. We spent a lot of the time with the aforementioned heron, but also saw thousands of ducks (especially northern pintails), another disappearing otter, and a dancing night heron. 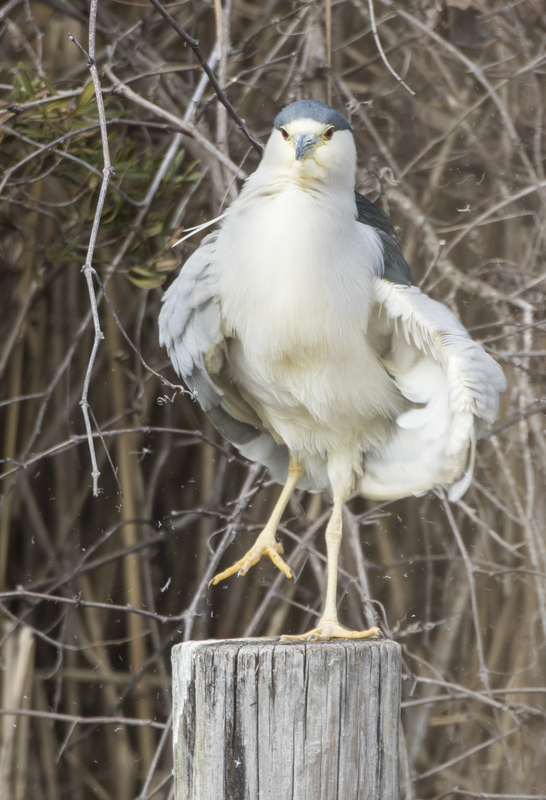 An adult black-crowned night heron was on one of the usual pilings in the pool near the entrance to Mattamuskeet, so we stopped and walked over to admire. It was striking their usual stoic pose, when, all of a sudden, it went through a series of gyrations that would make any dance contestant proud. When it settled back down, it did a quick poop (lighten the load) and flew off. After spending a couple of hours at Mattamuskeet, we headed back to Pungo for what we hoped would be a grand evening show. 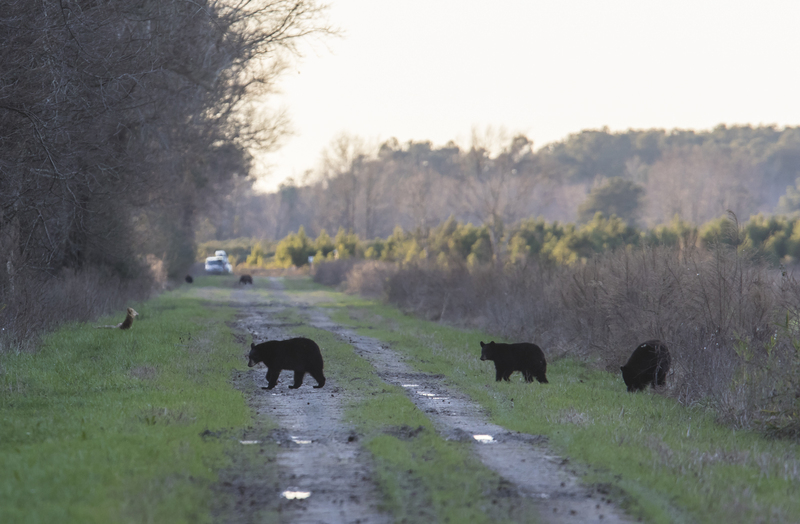 The walk down Bear Road quickly showed why I dubbed it thus years ago, before real road name signs went up – five bears came out across the field to feed. After watching them mill about and horse around (a couple of young ones were wrestling), we headed into the woods. Melissa and I both commented that there isn’t as much fresh bear sign in these woods this winter – there is some, but not the totally worn down “bear living rooms” we have seen in the past. Suddenly, our friend said, “Look, a tiny owl”! I had been checking out every snag as we walked, so I naturally looked at the dead top of the tree where she was pointing. I couldn’t see it. “Right there”, she exclaimed. 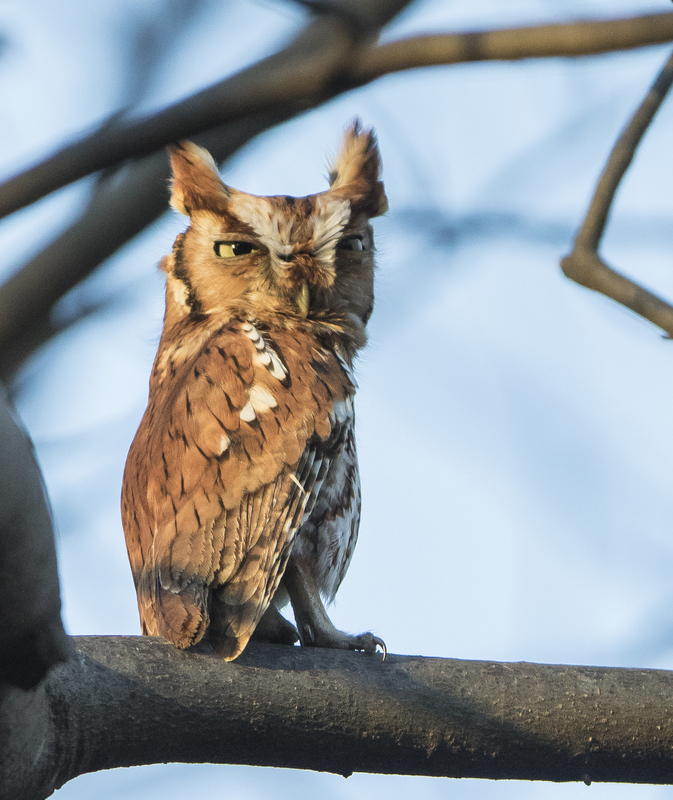 I followed her outstretched hand, and, to my surprise, there is a screech owl sitting out in the open on a branch several feet away from the trunk. The little guy barely moved its head to watch us as we slowly maneuvered, trying not to scare it. The fading sunlight would move on and off the owl, highlighting its beautiful rufous plumage. 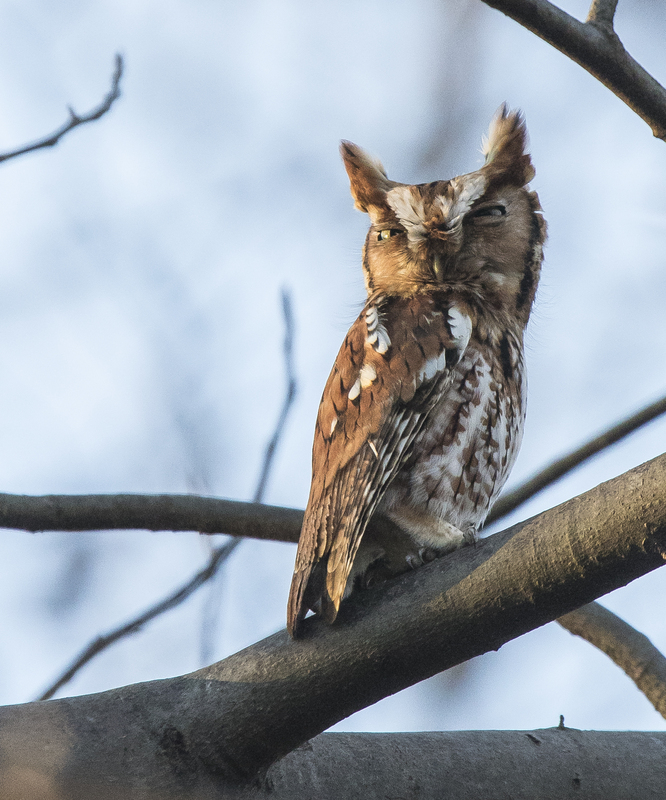 In a post from a very “owly” day a couple of years ago, I shared photos of another Eastern screech owl from the Pungo Unit. That one was a gray morph using a wood duck box as a nest site. 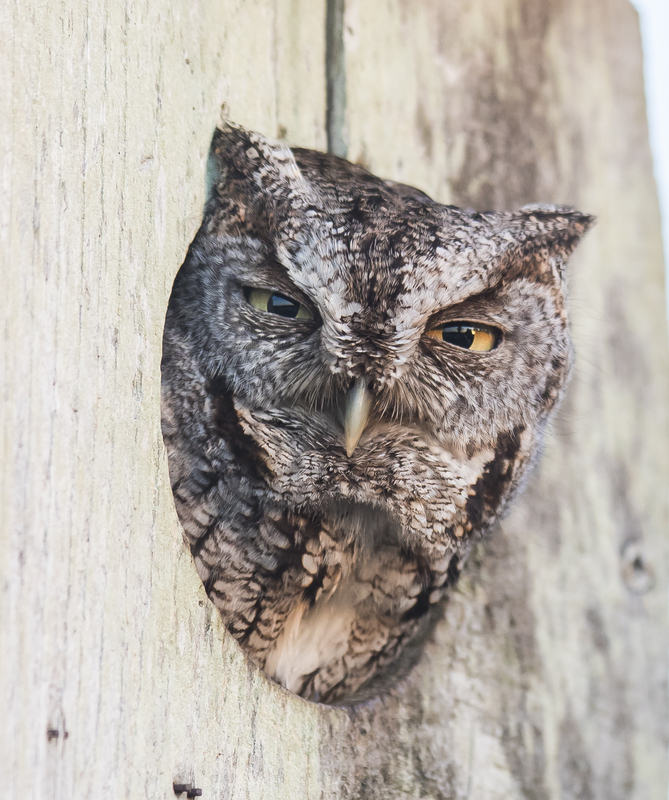 Eastern screech owls come in two primary color morphs in our state – red (or rufous) and gray (there is a third, a brown morph, in the far south). That doesn’t mean they can change color (they remain whichever color they are their entire life), it simply means there are two primary colors seen in this species. It turns out that the red color morph is more common in southern parts of the range, while the gray is predominant in colder regions. Plumage color appears to be correlated with thermal adaptation. 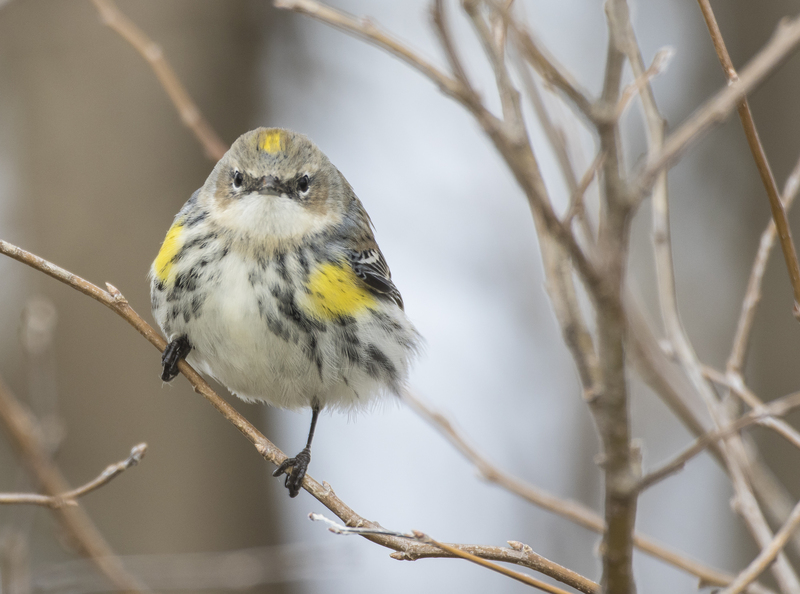 One ornithologist writing about the color morphs summarized findings that showed that gray birds survive colder temperatures better than red birds, which may account for their differential distribution. After observing the owl (and it, half open-eyed, observing us) for several minutes, we walked on, hoping it would not fall prey to any of the numerous winged predators that hunt these woods (great horned owls, red-tailed hawks, Cooper’s hawks, etc.). 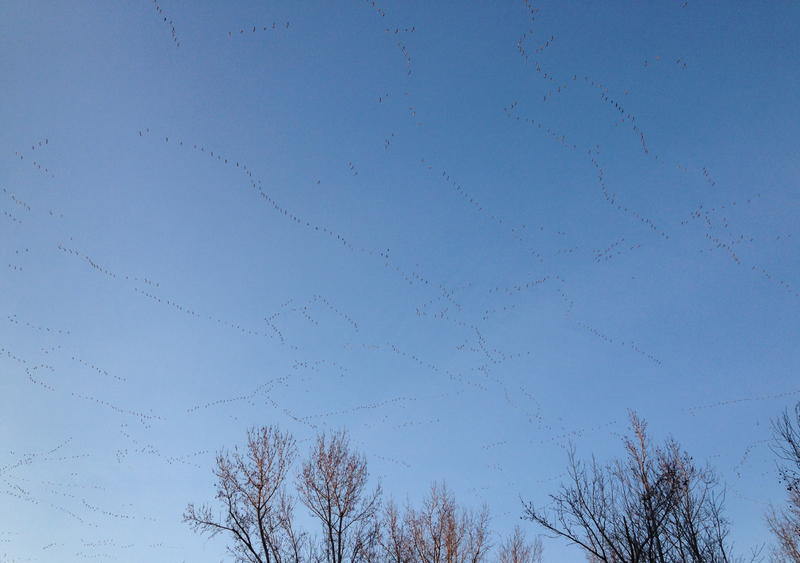 About that time, flocks of snow geese started to fly overhead and began circling the fields along Bear Road. We headed out into the open, hoping they would land. As we watched (and wondered about the energy budget of snow goose behavior), something else caught my eye down the road. A medium-sized black bear came out into the road and started ambling our way. When I alerted the others, we undoubtedly moved a bit, and the bear stopped in its tracks. He looked our way, then stood up to check us out. A standing bear always reminds me of how much we have in common with bruins. 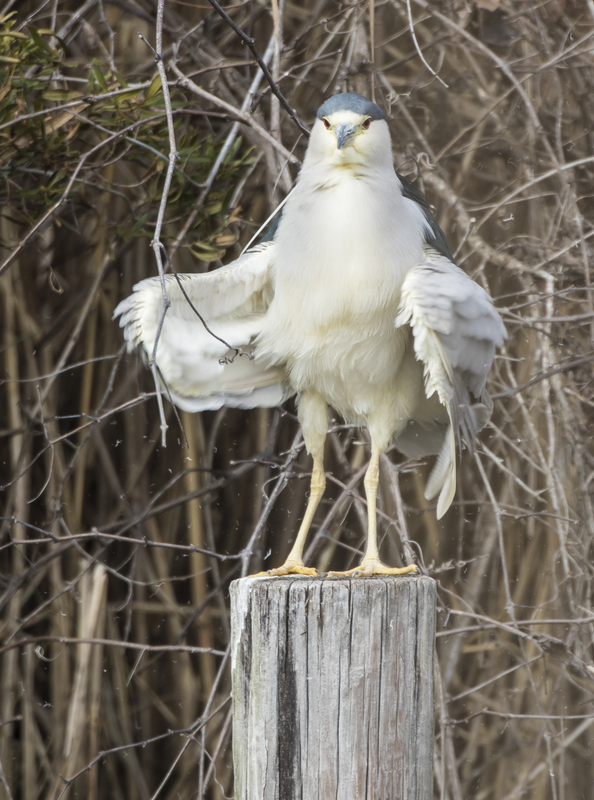 This one also looked as if he was trying out for a role in Gunfight at the Pungo Corral. He dropped and cautiously went back into the woods. 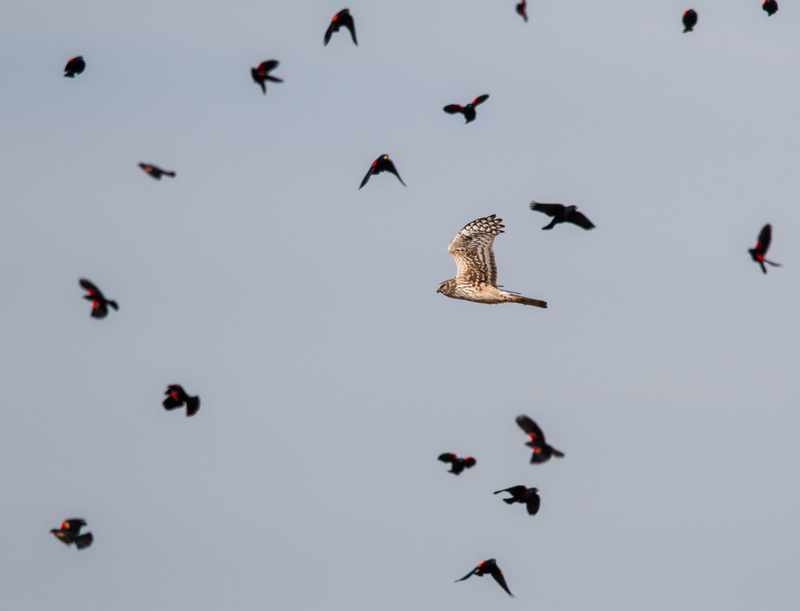 Our attention shifted back to the birds, which were now circling near us in dense, squawking clouds. I never tire of this visual spectacle and the incredible sounds that accompany it. For the next several minutes, we stood in awe of the scene before us – countless birds swirling nearby, swans flying over our heads back to the lake, and our bear friend tentatively trying to reach his canal crossover spot. The bear may be one I have seen over the past couple of years that we dubbed “buddy bear” (for his tolerance of humans). 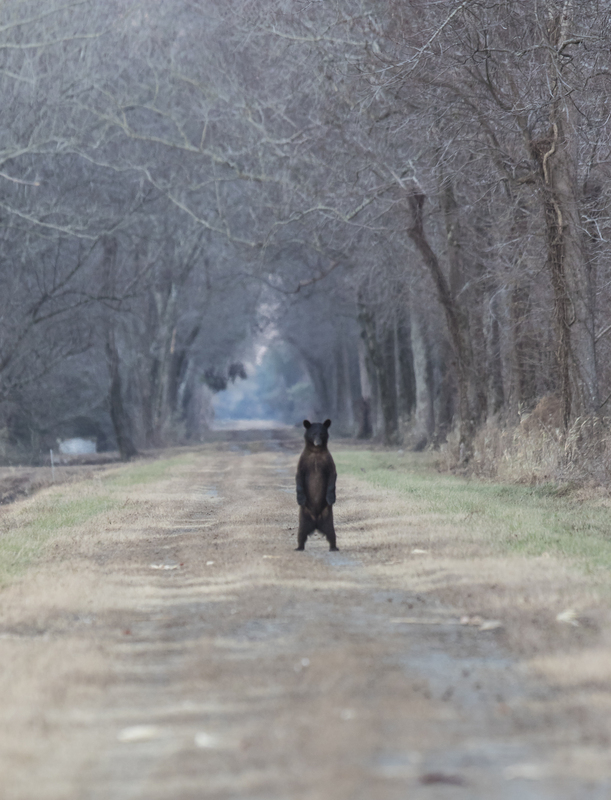 He kept coming out to the road, looking our way, then retreating back into the woods. He would then ease closer to us, come back out into the road, and repeat the sequence. 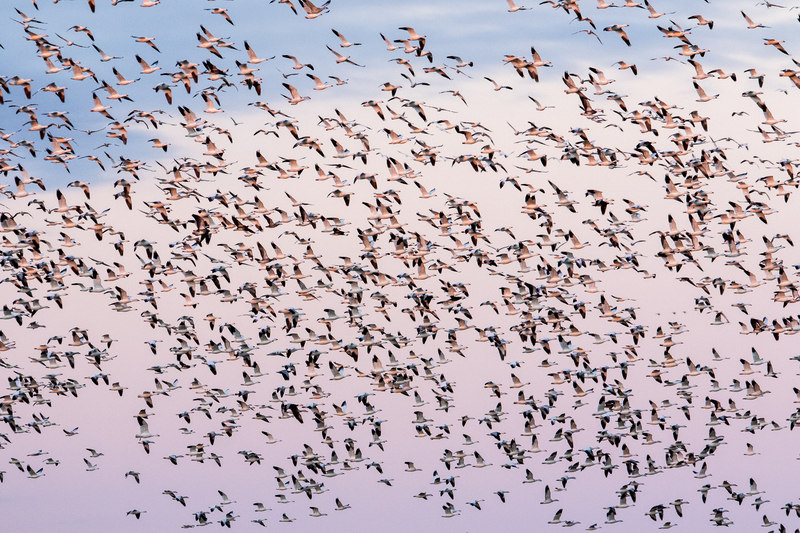 All the while, thousands of birds circled out in front of us…which way to look? 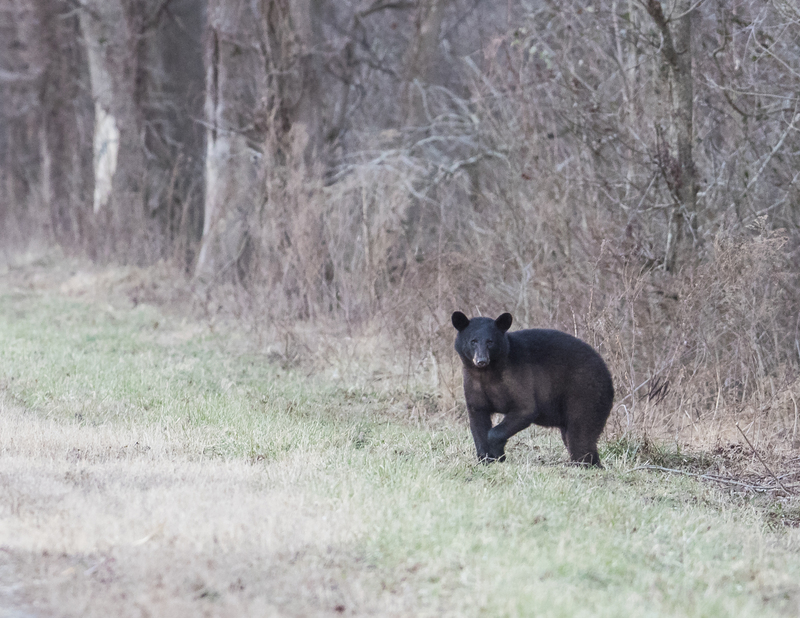 The bear ended up catching our attention again when he came out on the crossover path and headed down the canal bank. We all watched as he swam across, shook off, and scurried into the standing corn. What a privilege to be able to witness all this. 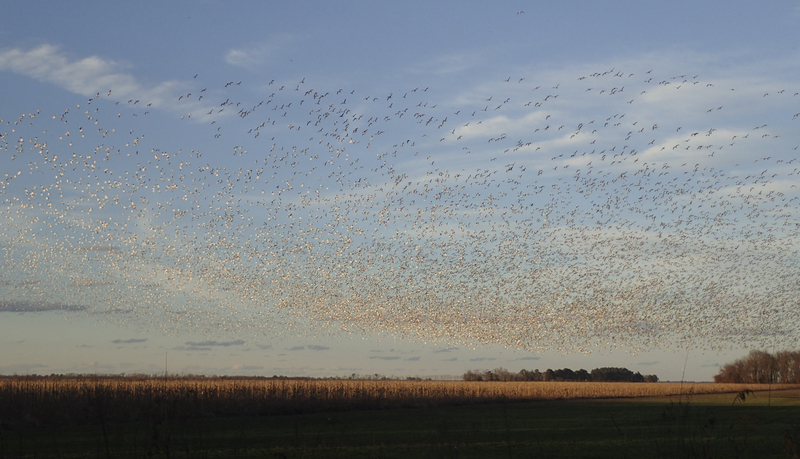 We started to head back to the car and then saw wave after wave of snow geese flying in from the northeast to join the thousands already landing in the corn. 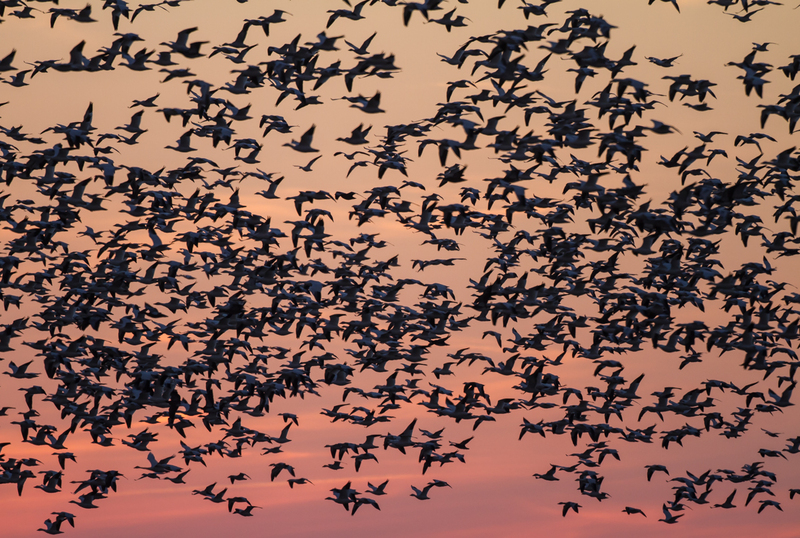 This was like the scenes of a few years ago – thousands of snow geese in the fields along Bear Road at sunset, hundreds of ducks swooping in to join them, bears coming out from several directions, swans calling as they fly in from the north, deer coming out of the woods, and woodcock streaking out into the fields to feed. Then we heard the final actor in this grand play – the haunting call of a great horned owl. Melissa soon spotted it in a tree not far from us. 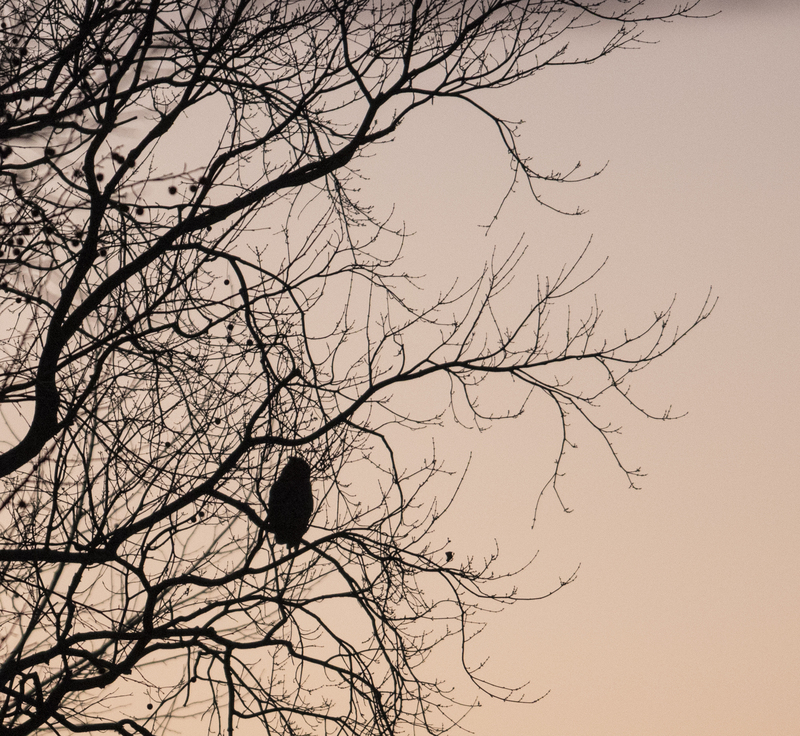 It flew to a branch out over Bear Road, silhouetted against the fading orange sky. What a great ending to an amazing day! This place is truly magical. It really is somewhere you go to feel alive, to recharge your spirit, and to rediscover a sense of awe and wonder about our world, Thank you, U.S. 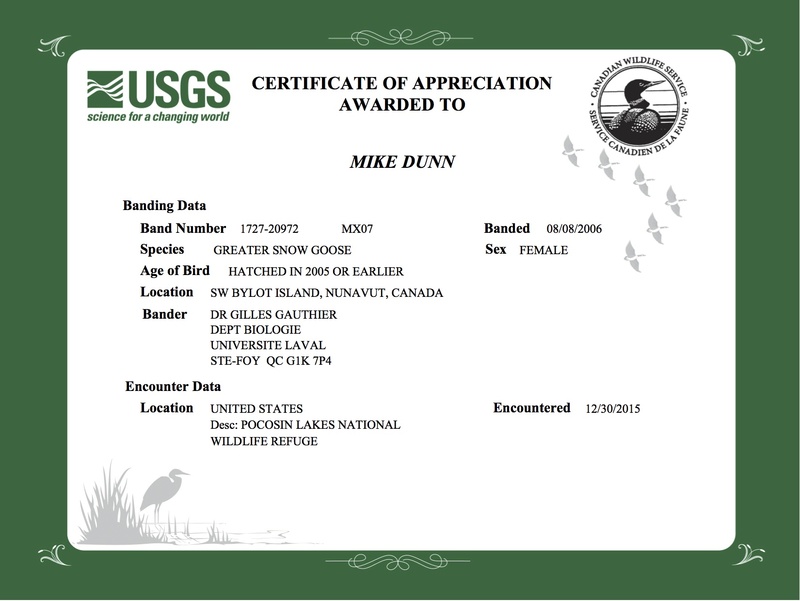 Fish and Wildlife Service, for making this possible. We all need to support these public lands, especially now, so they remain available for us and these amazing natural spectacles. 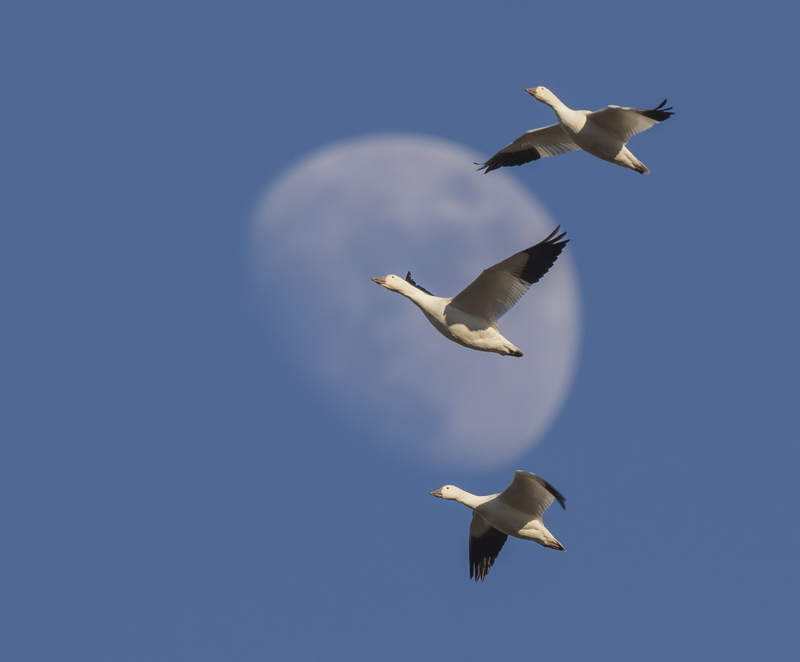 I liked the name, snow goose, and I liked the sight of them. 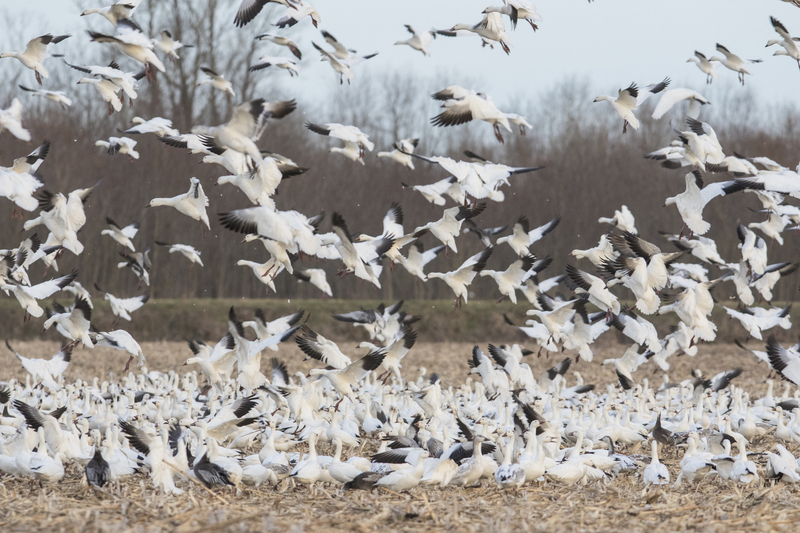 Here is a brief update on my post about this year’s Christmas Bird Count on the Pungo Unit of Pocosin Lakes National Wildlife Refuge…as I mentioned yesterday, we spent some time observing a large flock of snow geese when they landed in one of the fields near the refuge entrance. I finally got out of the car, went around back, and stood out of the rain under the open hatch to scope the flock. I was looking for Ross’s geese, and for collared birds. As I scanned the far edge of the flock, I finally spotted a yellow neck collar on one snow goose. As is often the case, the bird was partially obscured by a layer of bobbing necks and heads of other birds, making it difficult to read the collar code. I managed to get T as the first letter, and then 08 as the last two digits. I finally had Melissa get out and take a look and she nailed it…TJ08. We recorded that to report when we got home. Yesterday morning, I submitted our observation online at the USGS Bird Banding Laboratory site for so-called auxiliary markers. This bird was banded by the same researcher that banded some of my previous records. The location is above the Arctic Circle in Canada, a distance of about 2600 miles from where TJ08 is spending this winter. 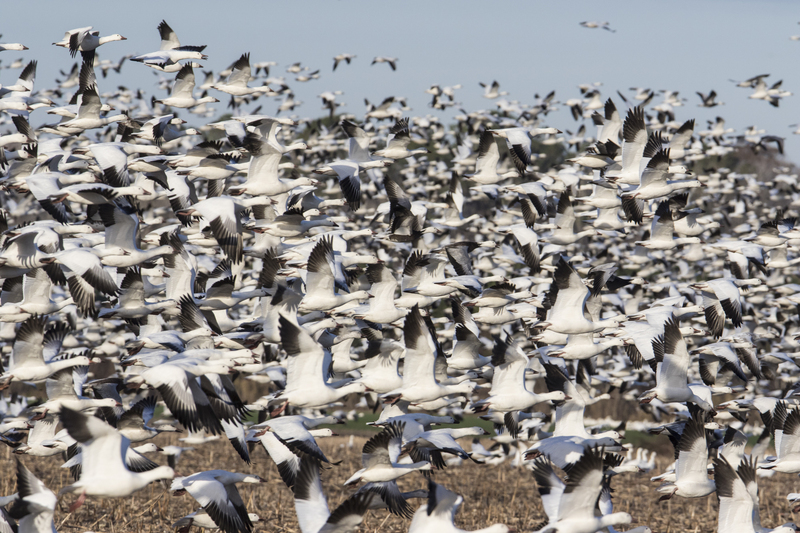 Seeing this record of one bird’s remarkable journey reminds me of how much I have missed the huge flocks of snow geese the past couple of years. 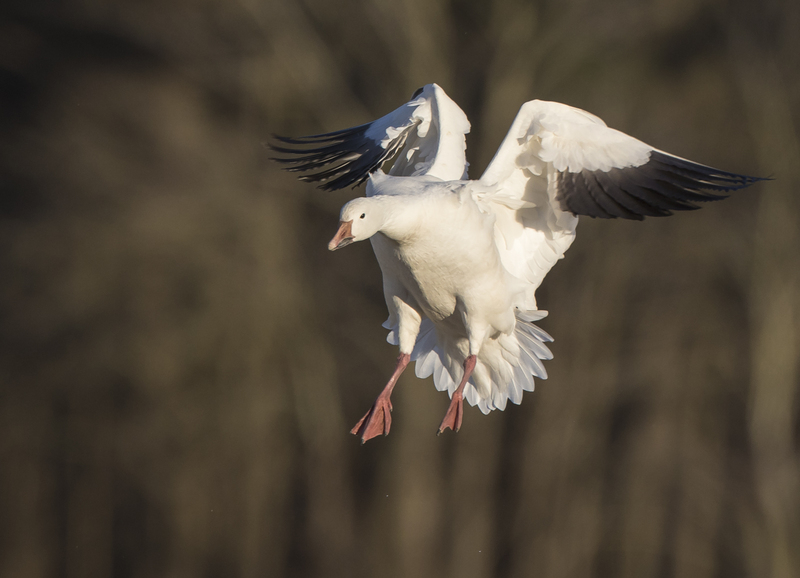 Their behavior has been less predictable, their numbers lower, but there are signs that this year may be a good one for observing snow geese at Pungo. 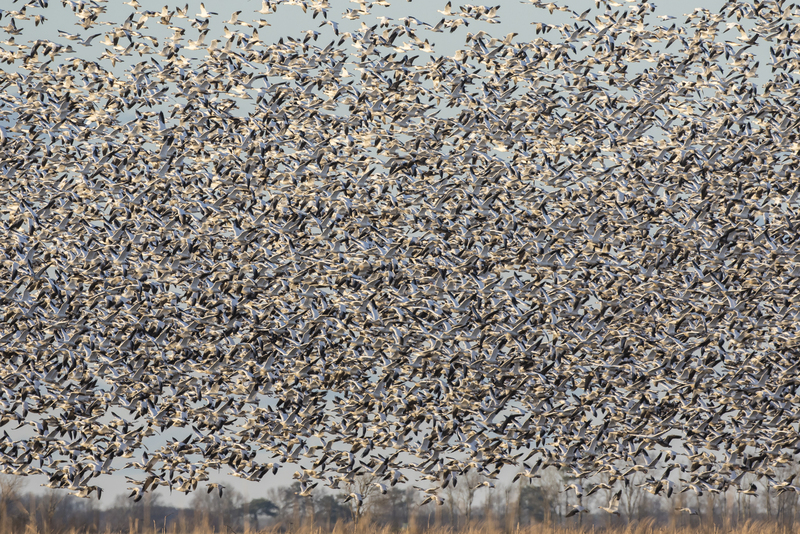 There really is something magical about the huge flocks of noisy birds. 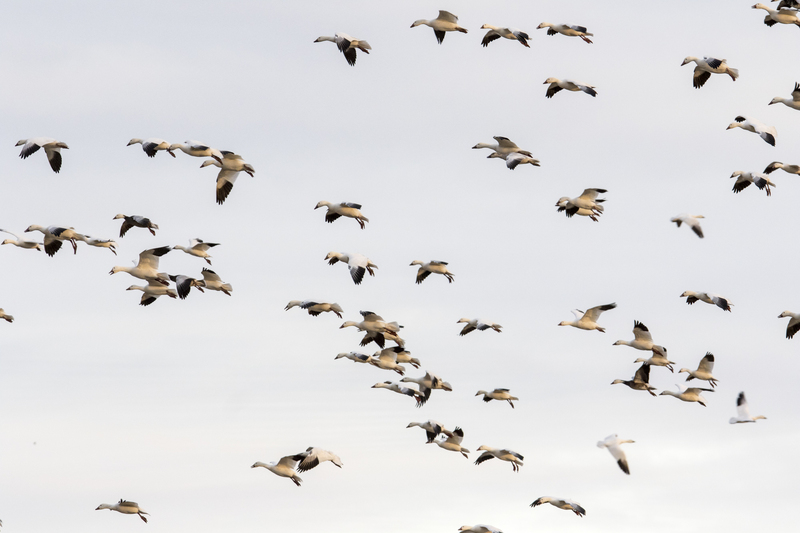 Mary Burns puts it well in her book about snow geese – I was surprised, then stopped breathless for a moment, by the sudden rising of tens of thousands of snow geese at once, the airy tumult of the madly beating black-tipped wings, the high soprano bark of their calls. I described them to someone as poetic, the way they stretch out across the sky like the broken lines of verse. I thank TJ08 for helping make the winter wonderland of Pungo another memorable line of poetic verse. 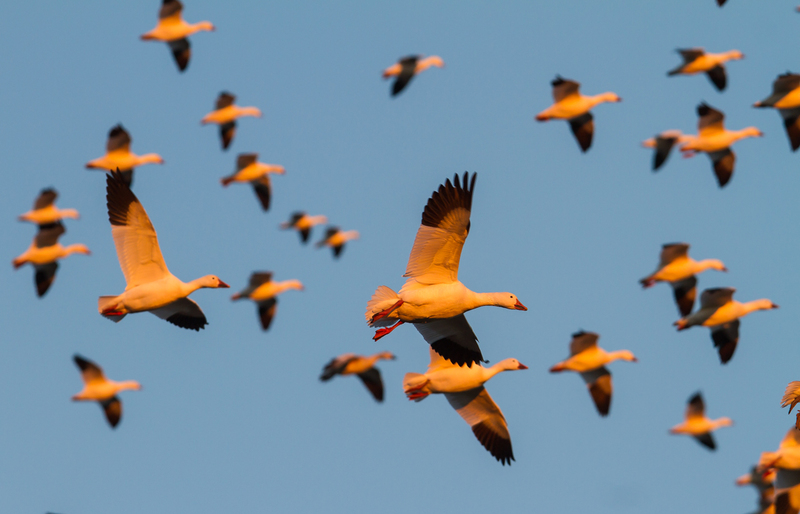 Don’t refuse to go on an occasional wild goose chase – that’s what wild geese are for. I am lucky in retirement to have more time to seek out places that provide a wildlife spectacle. There is something transformative about witnessing masses of animals in a wild place. 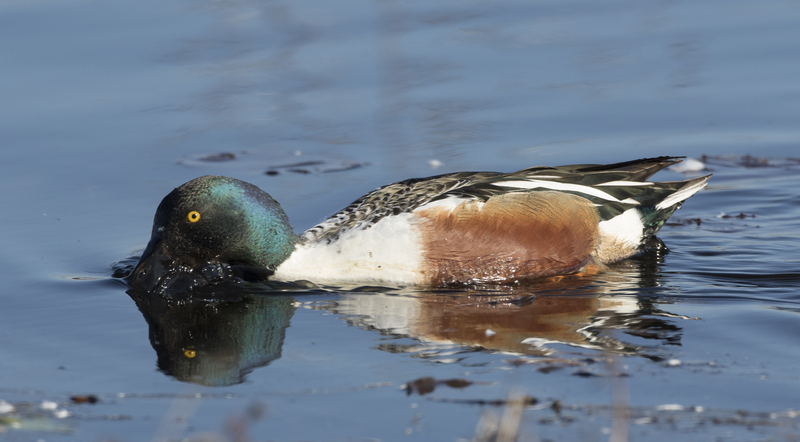 This time of year, one of the true spectacles at many of our wildlife refuges in the East, is the concentration of waterfowl of various species on their wintering grounds. 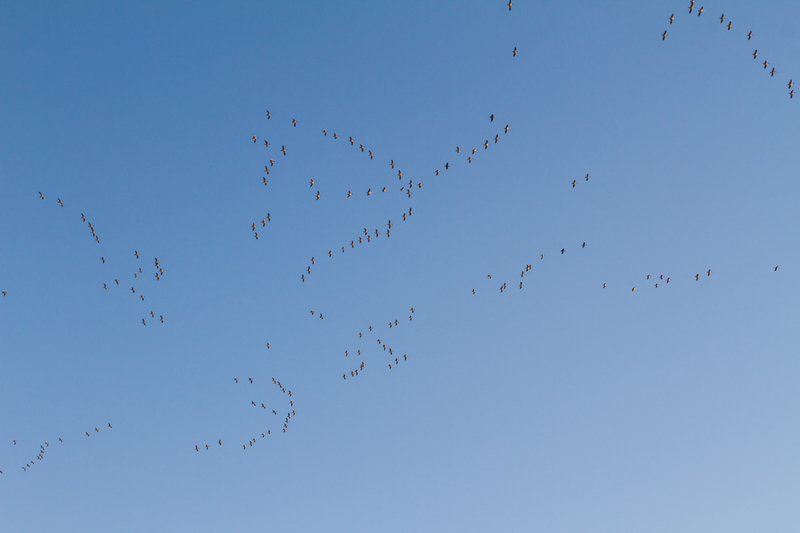 One of my favorite sights and sounds of winter is a huge flock of Snow Geese flying overhead. So, about a week ago, I went north to Chincoteague looking for waterfowl. It snowed on my second day, and the next morning I went out one last time looking for large flocks, hoping the cold and wind might concentrate them. The flock was there but easy to miss as they were hunkered down on an over-wash fan on the sound side of the beach parking area. 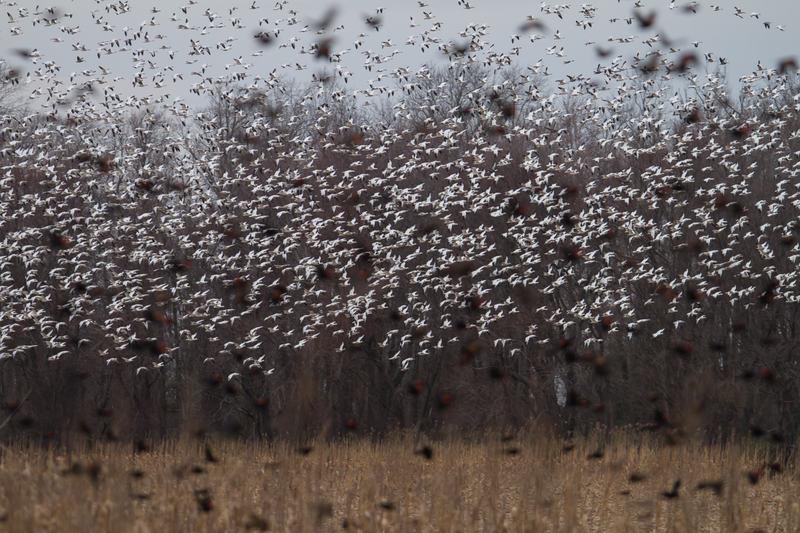 There were maybe a little more than a hundred Snow Geese in this group. I pulled up to watch and not a goose moved for several minutes. With temperatures in the teens and a strong wind, I didn’t blame them. Finally, a few got up and walked toward the marsh to feed when another hundred or so flew in. 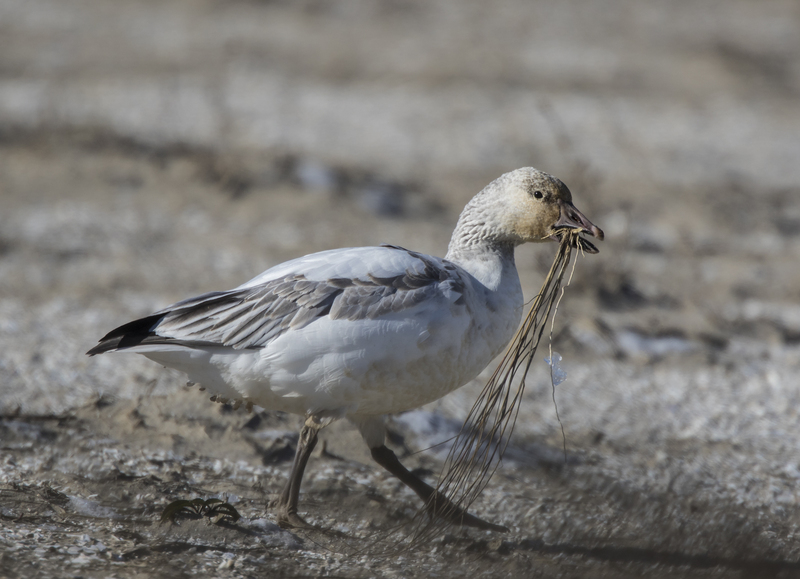 In areas with extensive marshes, Snow Geese tend to grub up the marsh grasses, consuming almost any part of the plant from roots to stems, to leaves. 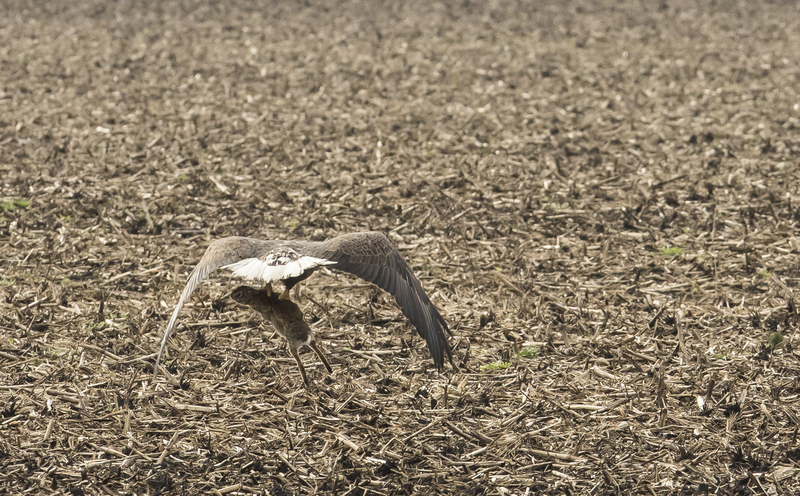 This grubbing behavior often leads to the white head, neck, and breast feathers having a rust-colored stained appearance due to the mineral content of the mud. 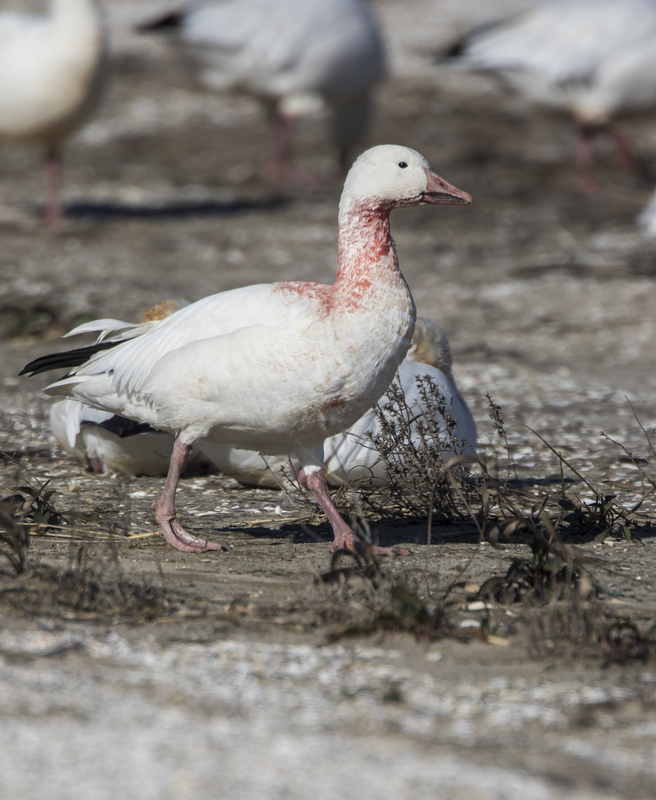 I rarely see this on the Snow Geese at Pungo, as they tend to feed more on waste grain in agricultural fields. Before leaving, I did see a goose with a different color – blood red. This goose had been injured (shot perhaps?) and had been bleeding somewhere on the head or neck. 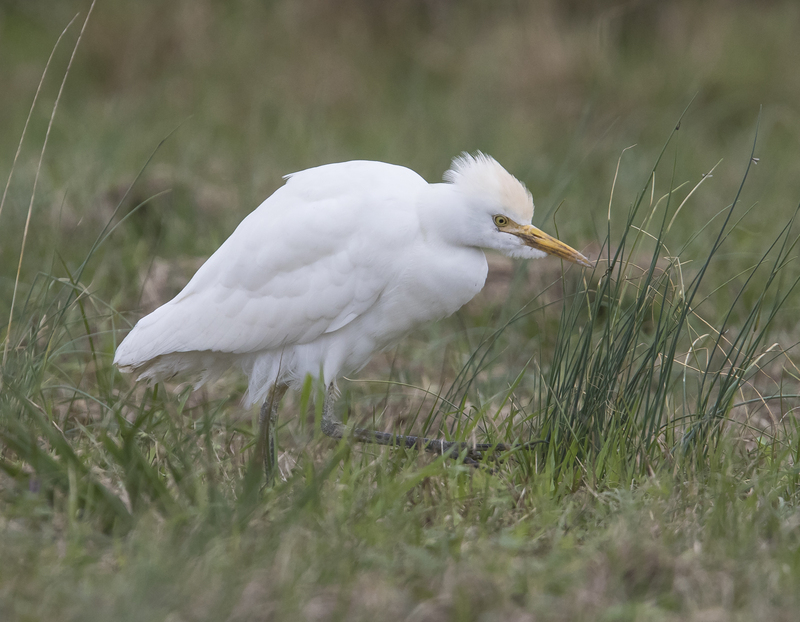 After watching the bird for several minutes, it seemed to be doing well, moving normally and feeding with the others in the marsh. 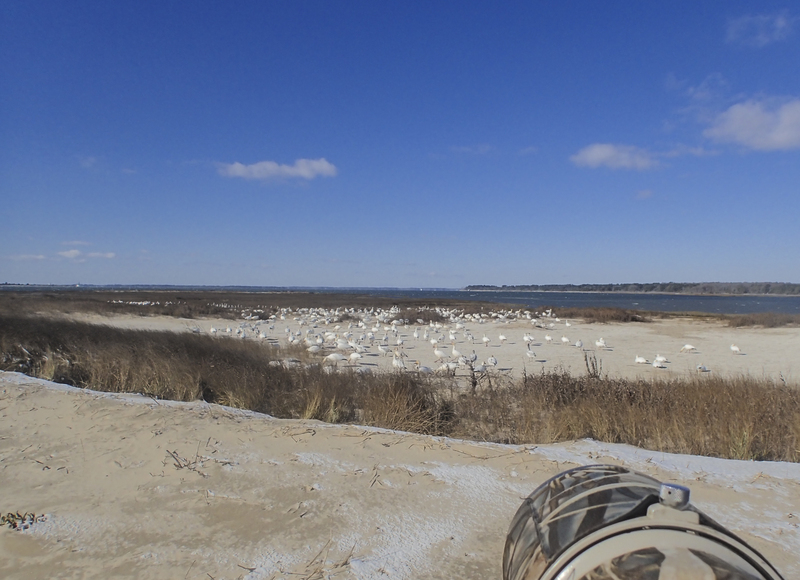 With relatively few birds at Chincoteague, and one more day to look for large flocks, I headed back to my favorite place, the Pungo Unit of Pocosin Lakes National Wildlife Refuge, to spend my last day on the road searching for snows. The flock did its usual thing, noisily circling the field, breaking up into a couple of white clouds, and started landing. A lot of the swans decided it was time to head back to the lake with all the commotion starting, so the scene was chaotic with birds circling, others leaving, and everyone making a lot of noise. It is tough to take it all in. I certainly can see how flocks can confuse predators, as I found myself not knowing which way to look or point the camera, since there was something happening in all directions. This was all repeated the next evening, so these photos are from two afternoon shows. 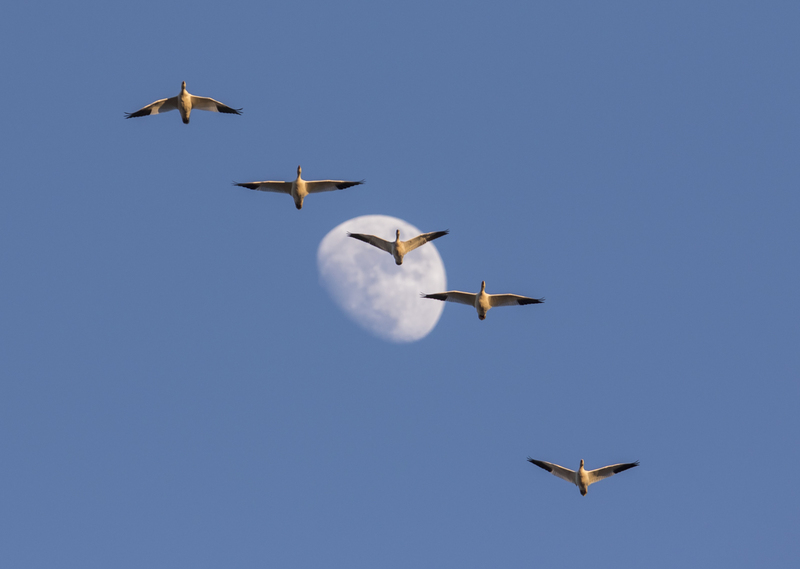 This is what I wanted to see, the large swirls of birds in the sky, the late afternoon light tinging their bodies and wings with hints of gold. 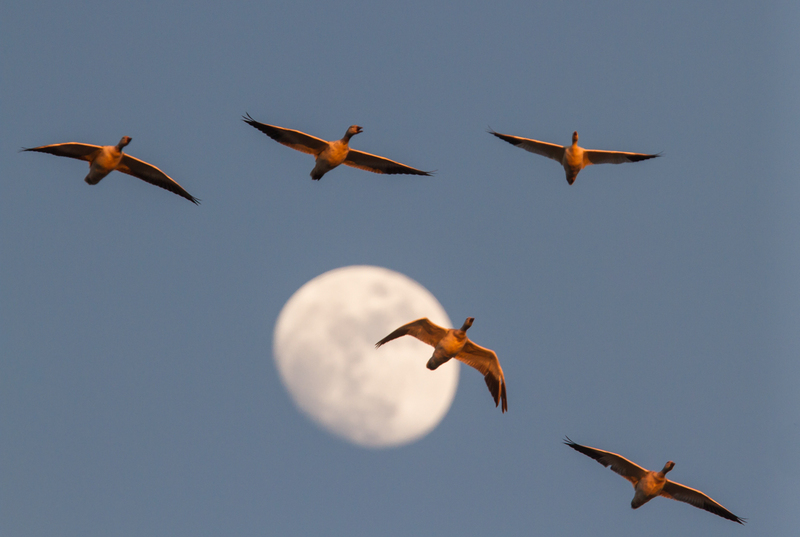 An almost full moon overhead added a touch of elegance to the scene, as did the graceful swans. Both evenings, the sea of white moved closer to the edge of the road where I stood, getting access to the corn that remained uneaten. The geese kept coming in, streaming down among the swans, who seemed disturbed by the interlopers in their field. 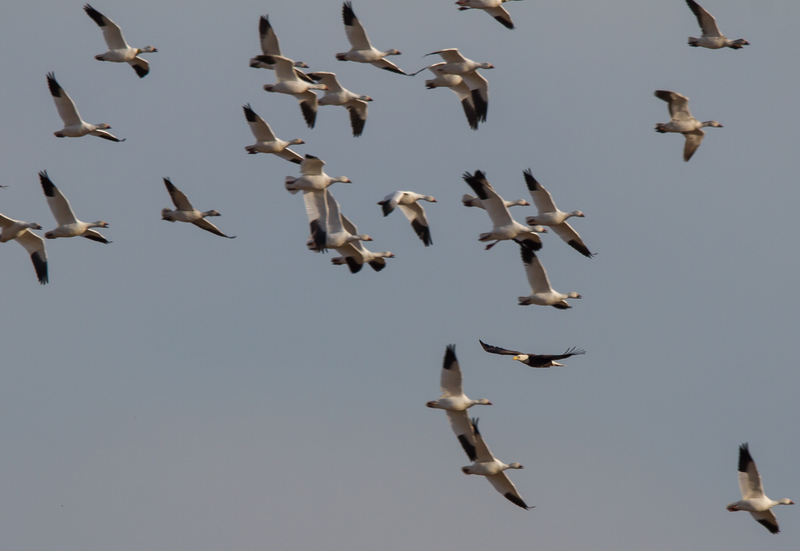 Noticeable among the white birds are several of the darker color morphs. 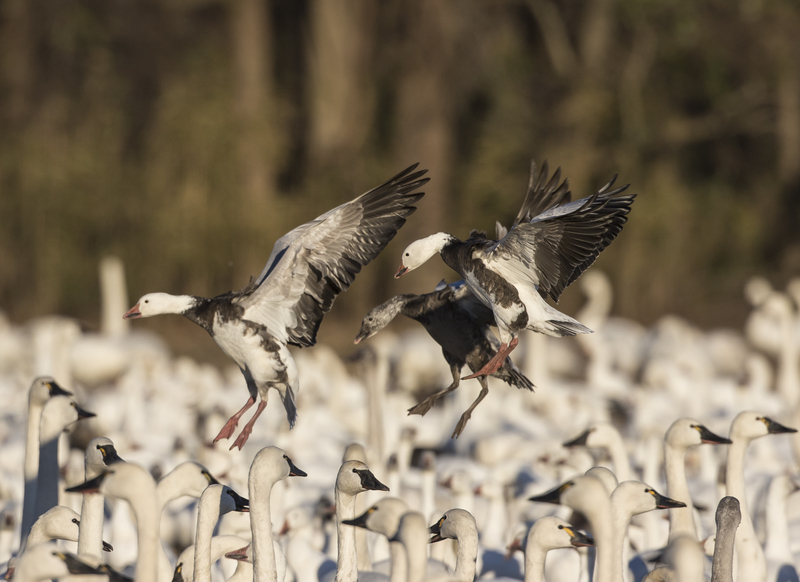 Long believed to be a separate species, the Blue Goose, these are now known to be a color morph of the race of Lesser Snow Geese. This color variation is controlled by a single gene. The two color morphs can mate with each other and produce young of either or both colors. Near the edge of the churning flock, I spot a diminutive Ross’s Goose. roughly half the size of a Snow Goose, but otherwise very similar. 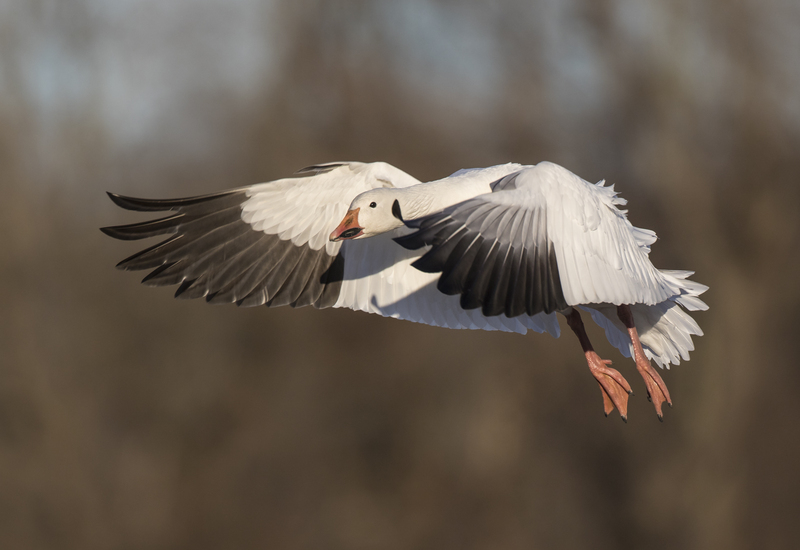 Their bill is shorter and lacks the black “grin line” of a Snow Goose, but that feature is not always easy to discern as their heads bob up and down while feeding. A car pulls up, and people jump out, and the birds close to them blast off with a deafening sound of squawks and wings. With a telephoto lens, I just capture a tiny window of the scene….imagine it one thousand fold for a sense of the immensity of the upward moving snow storm. They circle and land again. The wind is coming from my back, as is the sun, causing the beautifully lit birds to land facing my camera, just what you want for capturing images of winged snowflakes. 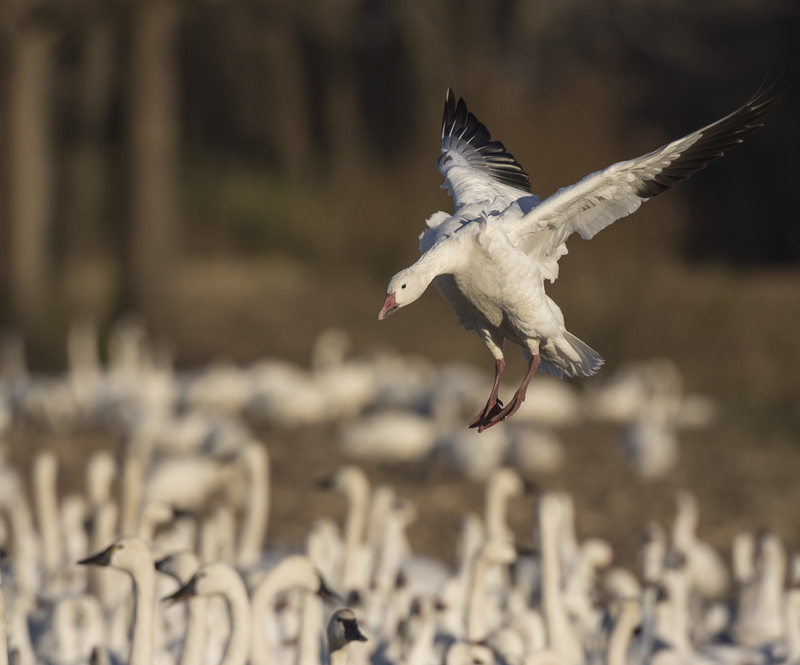 Populations of Snow Geese have increased dramatically since the early 1900’s, when hunting was stopped due to low numbers. It resumed again in 1975 after populations had recovered. 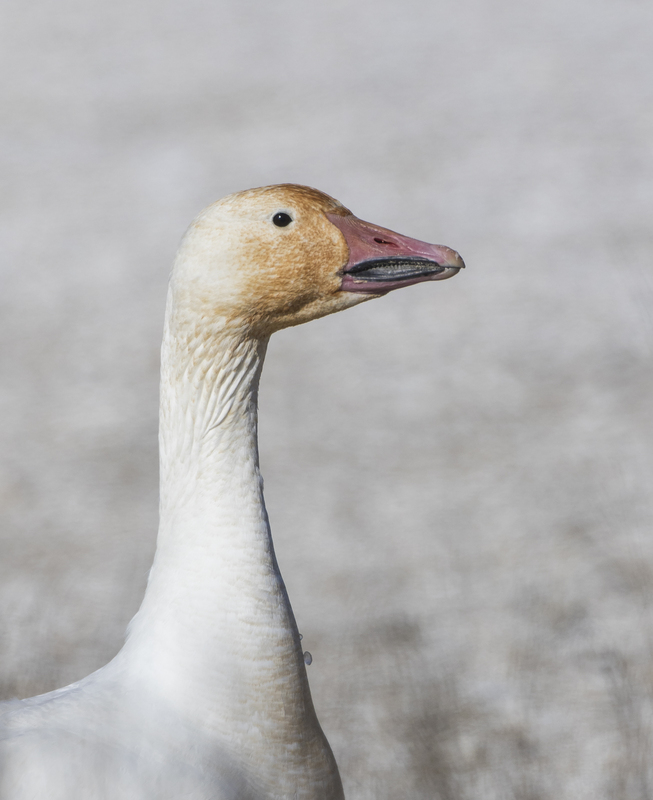 The numbers have continued to grow, causing some scientists and managers to think that the tundra nesting habitat of Snow Geese is beginning to suffer from such high concentrations of feeding birds in summer. 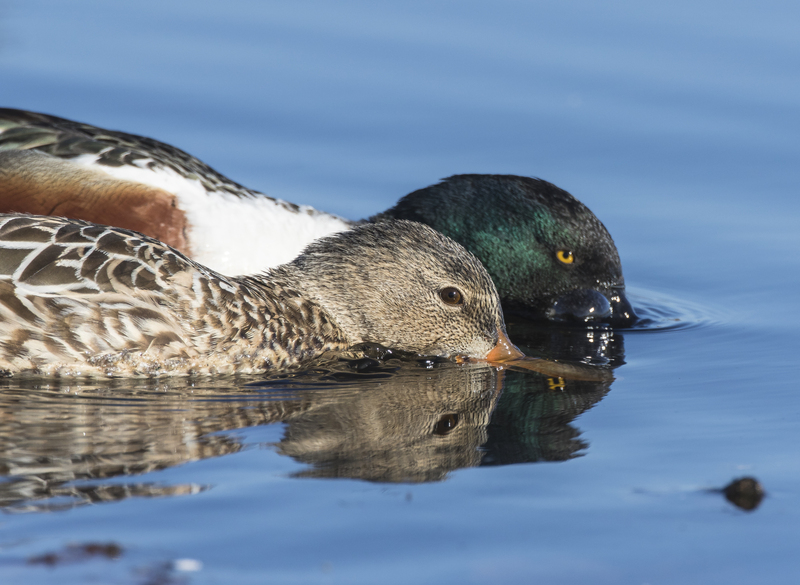 They are now probably one of the most abundant waterfowl species in North America, and concentrate in huge flocks during migration. 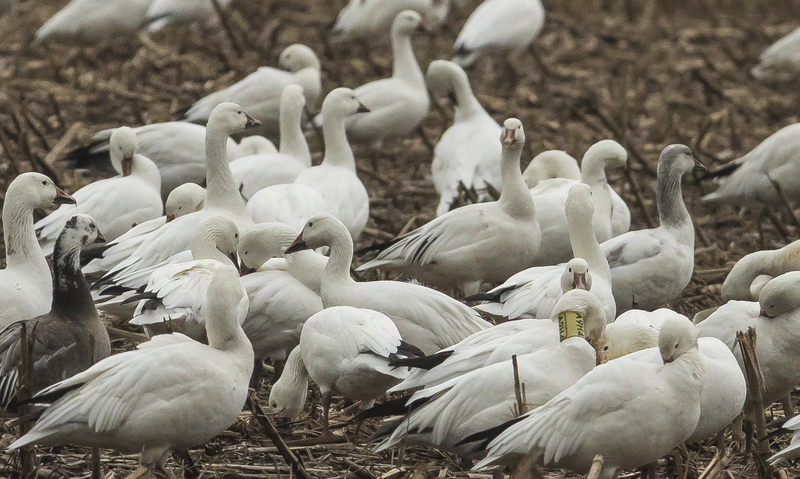 A friend recently told me that our refuges can’t justify planting corn for Snow Geese because their numbers are so high. 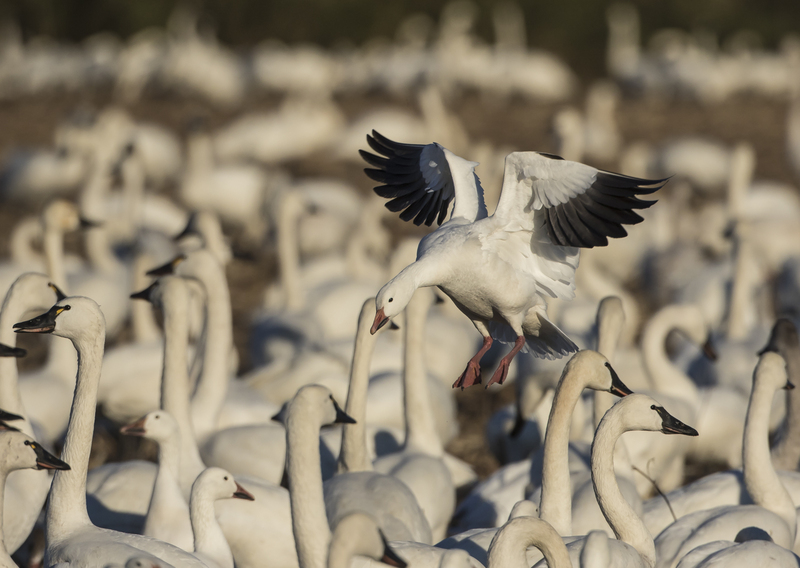 But, we both agreed, from a refuge visitor standpoint, the Snow Geese offer a spectacle that few other species of wildlife can match. I had two groups scheduled for trips over the last week, one a group of photographers, and one some friends from my museum world. The weather for the first group did not look great, but they all decided to roll the dice and give it a try. And I am glad they did, as there were some beautiful photographs taken and some wild scenes observed. The second group had much better weather, but it turned windy and much colder, which is often a good thing in terms of wildlife activity. 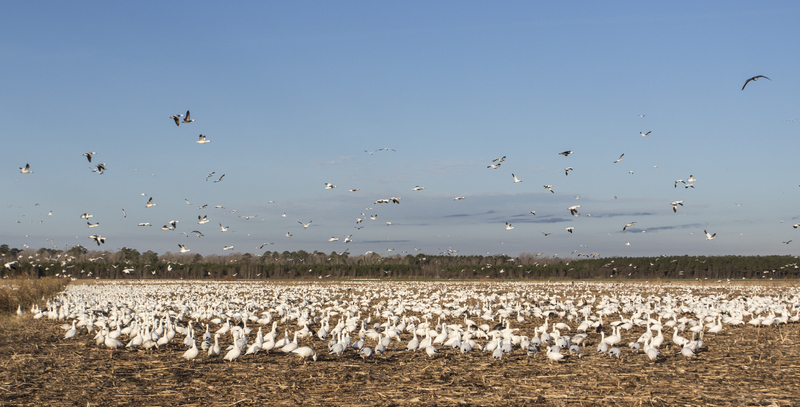 Birds were abundant, with an estimated 40,000+ Snow Geese now on the Pungo Unit of Pocosin Lakes NWR. The flocks are still being a little antsy, with the main flock circling the fields for quite some time before settling, and various groups breaking up and peeling off from the main aggregation. 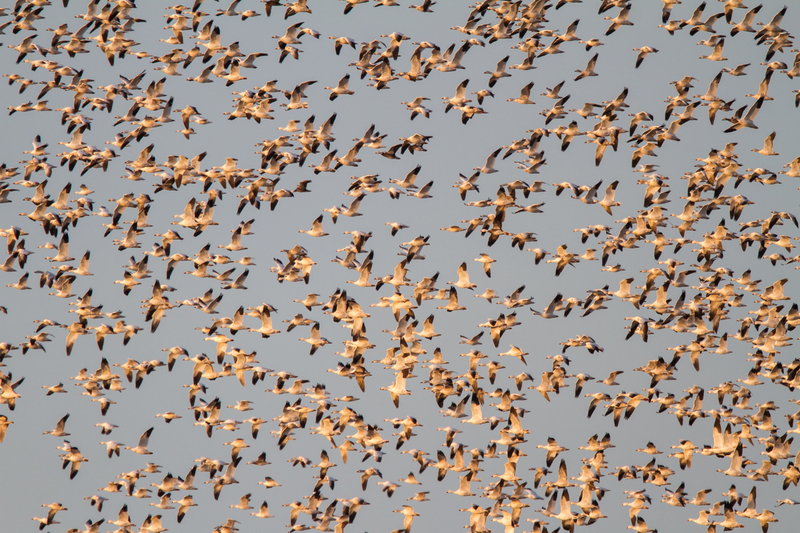 When they do swarm as a flock, they are truly magnificent to see, and hear. On the first morning with a group, we were treated to a bear wandering through the flock of Snow Geese in the field, causing a commotion as the birds parted to allow the bruin to pass (unfortunately, I had not carried my camera due to impending rain). 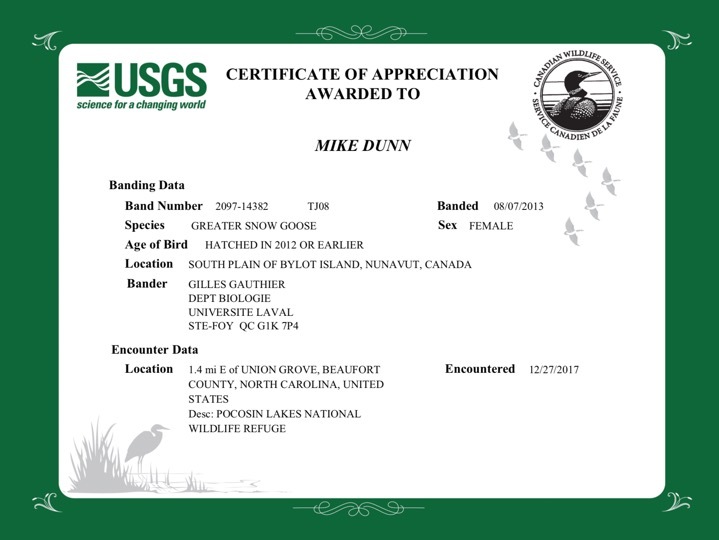 I answered a question from one of the group about where these birds had migrated from by showing them an image on my phone of a certificate I just received from my report of a Snow Goose collar (as related in an earlier post). 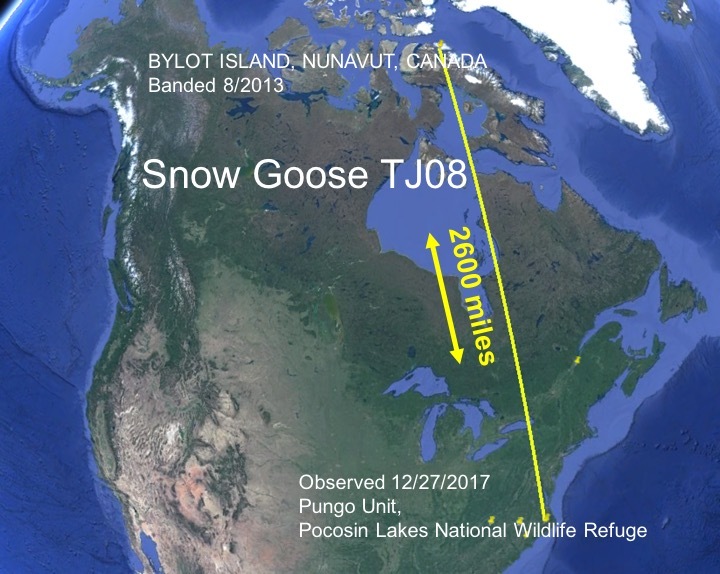 The two collared birds both had been caught and tagged in Nunavut, Canada, above the Arctic Circle. That is almost due north of their wintering grounds at Pungo Lake, and a distance of about 2600 miles. One thing that really surprised me was the age of one of the birds (MXO7) who was at least 11 years old. 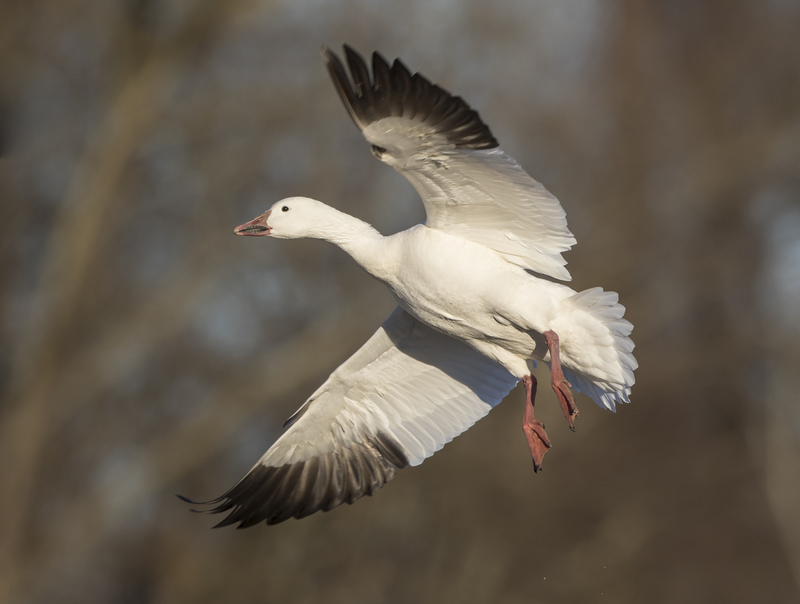 Assuming this Snow Goose has made this same trip, back and forth each year, it has flown at least 52,000 miles in its 11 years…that’s a lot of wing beats. Over the next few days, we saw the flocks in the same fields, coming out in the morning early, feeding for a couple of hours, returning to the lake to rest, and repeating the pattern late in the afternoon. As we walked along the path, the entire flock would occasionally blast off with a loud cacophony of calls and circle noisily before returning to feed. 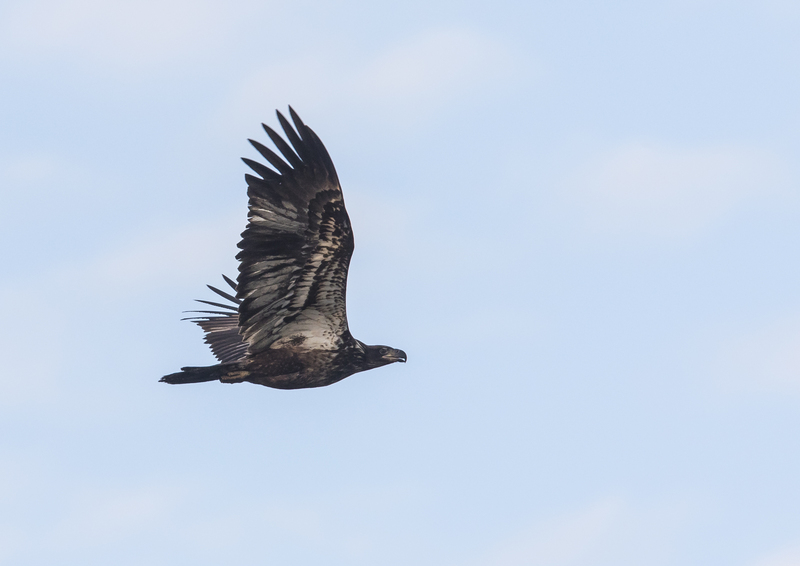 If you look closely, the usual cause for these nervous lift-offs is a passing Bald Eagle, like the immature eagle in the photo above.. I imagine the eagles are testing the flock as they cruise over, looking for weak birds, or something that might cue them in on an easy meal. 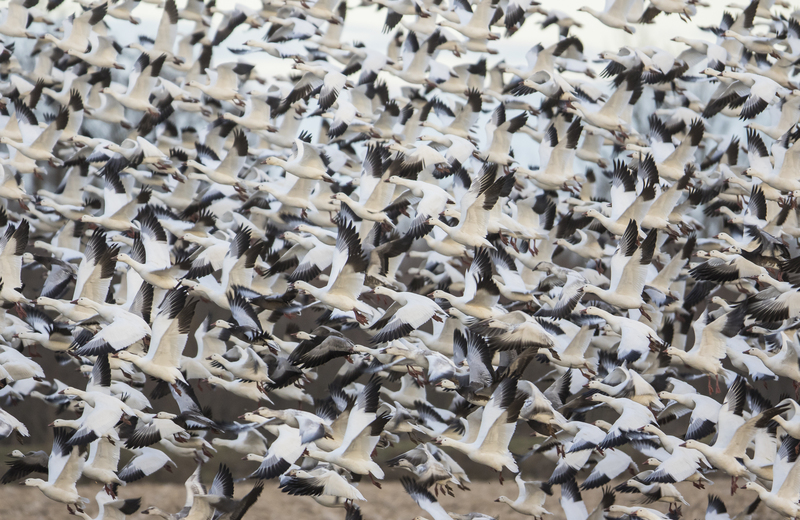 My new game when the birds fly over is to try to pick out a smaller Ross’s Goose out of the flock of Snow Geese as they pass overhead. It is obviously much easier once the flock has stretched out in lines, rather than when they are tightly packed together. 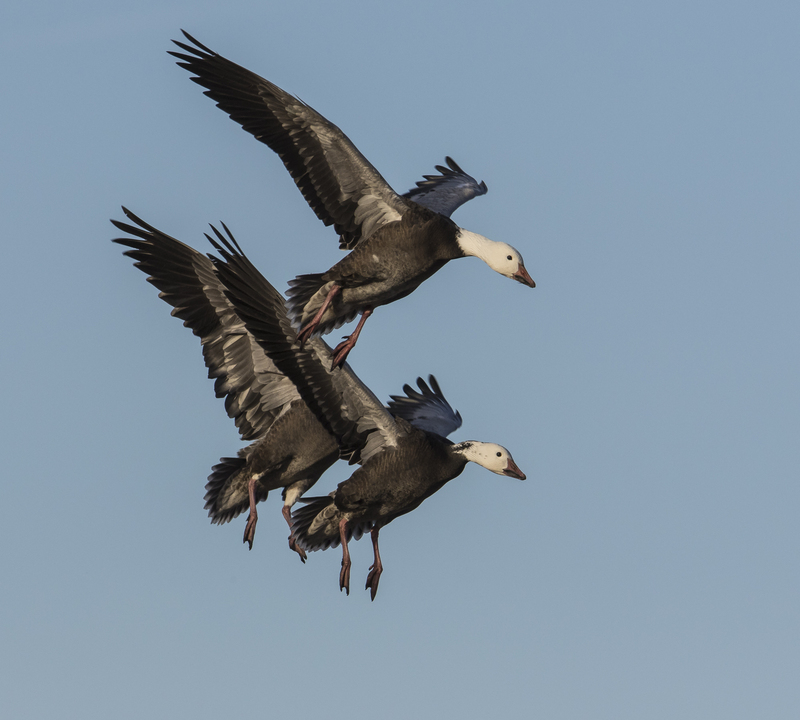 They did as I had hoped, taking off in one giant swoop, and spreading out over the pink-tinged sky, making an incredible sound as they winged their way to the safety of the dark waters just beyond the trees. Sydney had walked out toward me just before the bird’s departure. It was an a truly spectacular introduction to the wonders of Pungo on her first visit. There were many other bird highlights in my 6 days at the two refuges, many not recorded by my camera, but indelibly etched in my memory. Of the latter, there was a Peregrine Falcon streaking by the corn field; a Merlin accelerating across s the tops of the corn resulting in an explosion of Red-winged Blackbirds, but no kill this time; and the high-pitched shriek of a Wood Duck as it dipped and ripped through the treetops with a raptor of some sort (probably a Peregrine or a Cooper’s Hawk) in hot pursuit. 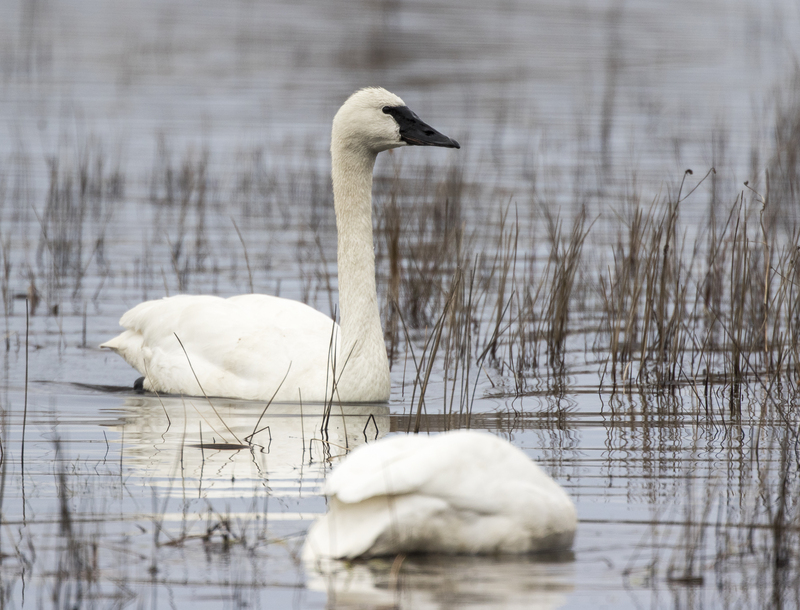 At Mattamuskeet, there have been reports of a few Trumpeter Swans hanging out along Wildlife Drive. 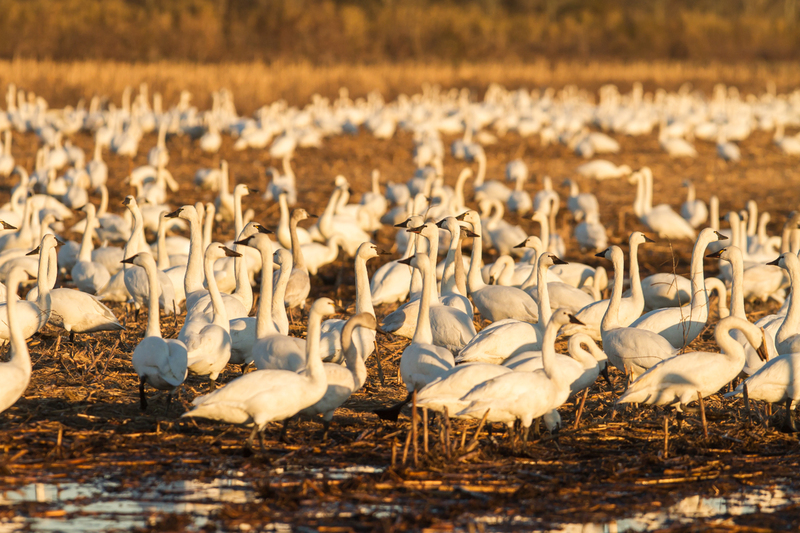 On my scouting trip the first day, I came across a group that I think were the Trumpeters – slightly larger, no yellow on the bill (although that can vary on Tundra Swans), and a longer, and more sloping bill. They also apparently curl their necks into more of an S-shape and rest it on their body when in a sitting or resting position. 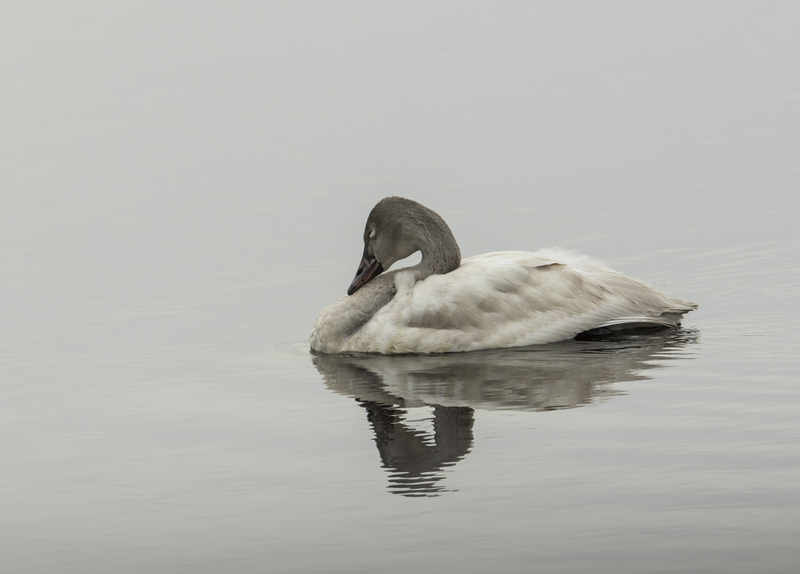 There were a couple of juvenile swans nearby that I think were also Trumpeters as they had darker heads than most of the immature Tundra Swans I see. A few other highlights of a great trip to two of my favorite places…I can’t wait to go back. 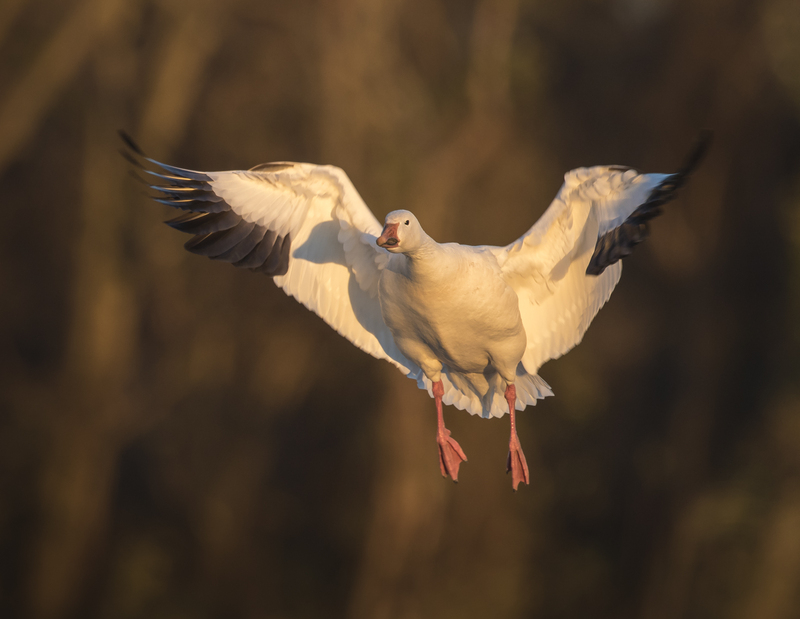 Having been stuck in the Piedmont the last two weeks with other priorities, I imagine the Snow Geese have left their winter home at Pocosin Lakes NWR and started their long journey north. 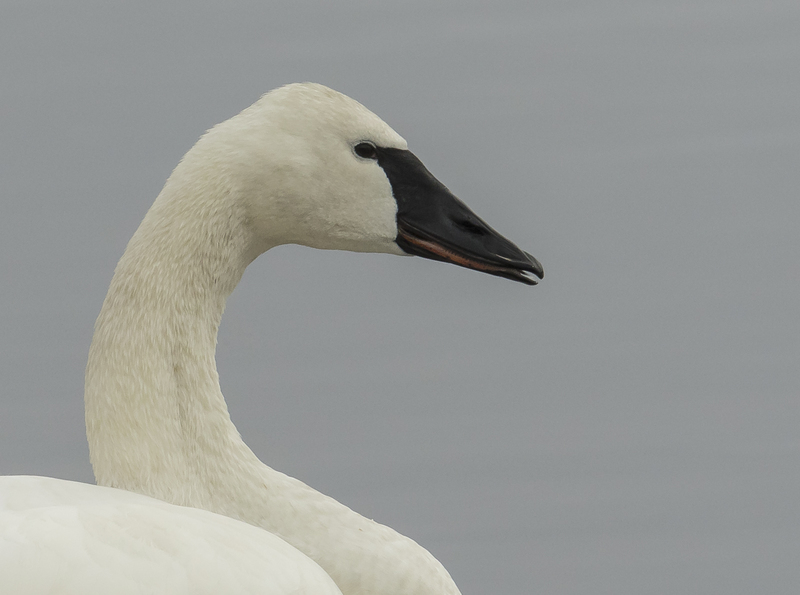 The Tundra Swans have probably started as well, but my guess is that some are still hanging around with all this cold weather we have had lately. But, soon, they will all be gone, not to return until next winter. On a recent trip, some of the local weather experts, the trees, were telling me it was almost time for the birds to leave. 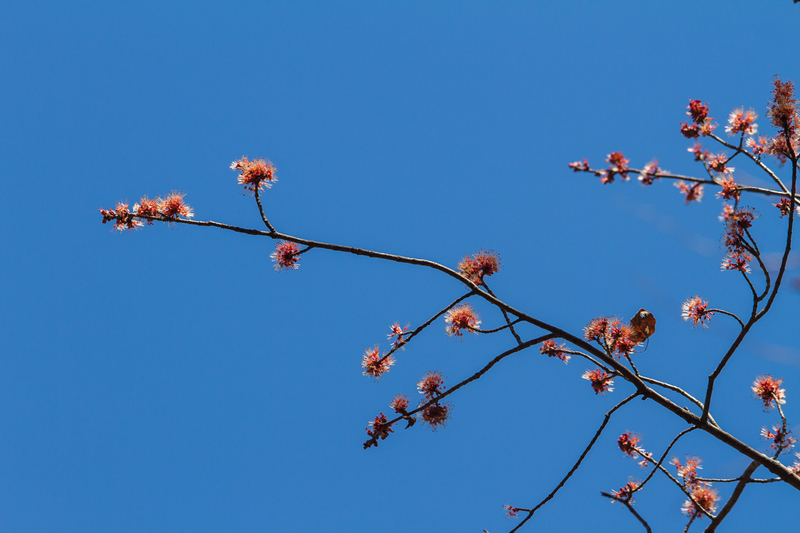 And when the Red Maple flowers start to bloom, it won’t be long until the frogs are calling (actually, we heard some back in January) and the winter waterfowl start winging their way to the breeding grounds. So, as I sit here in the Piedmont on a snowy day when others are wishing for the sixty degree days of early Spring, I am thinking of the first cold blasts of air in November and December next year that will bring with them the amazing birds of winter. Here is a short video of the last flock of Snow Geese I saw this winter, shot on my last trip two weeks ago, They remind me of animated snow flakes falling into the corn field…I hope those of you that are sick of the cold, ice, and snow can forgive me, but I can’t wait until next winter. The sky is that beautiful old parchment in which the sun and moon keep their diary. …and sunset. And so it was on my last trip. 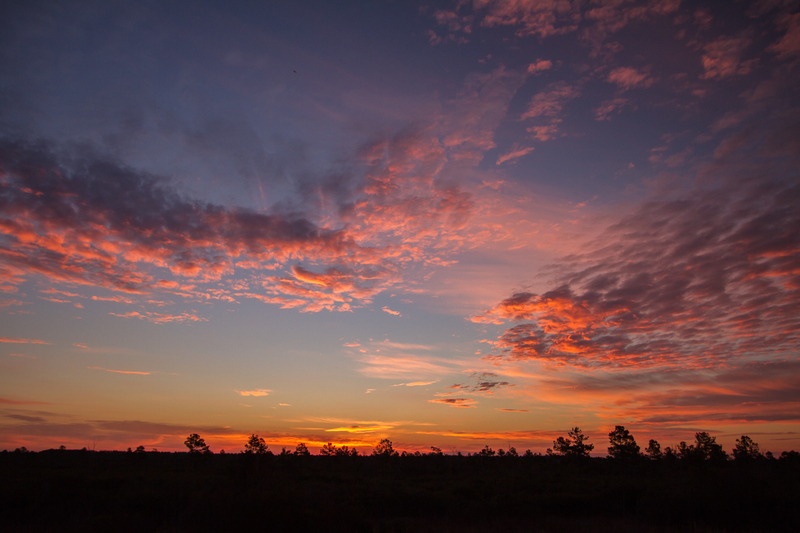 The morning had been spectacular at the swan impoundment. I wasn’t paying much attention at first to the goings on in the sky as I was so focused on the swan silhouettes on the water in the orange-gold glow of sunrise. After photographing the swans swimming and preening, I finally turned my attention to those starting to fly out of an adjacent area. The last bits of golden light soon faded, but not before I caught an image or two with it bathing the undersides of a passing swan. High clouds soon moved in and the light changed dramatically. Now a few small groups of swans were starting to land in the impoundment to join the hundreds of others already enjoying the swan spa. I love to watch them as they prepare for a graceful touch down. I left to head towards a favorite area and was surprised to see no cars in spite of it being a beautiful (albeit cold) Saturday morning. The Snow Geese had already flown off the lake by the time I arrived and were circling the fields in their usual erratic attempt at settling down. I took a few shots as they circled far across the corn and then started walking down the road. Suddenly, they all blasted off with the distinctive whoosh sound of thousands of wings. I stopped, hoping to see what might have spooked them. It can be anything, or seemingly nothing at all. I scanned the field edge for bears and the sky for any sign of a predator. One thing that will always flush the flock is an eagle. 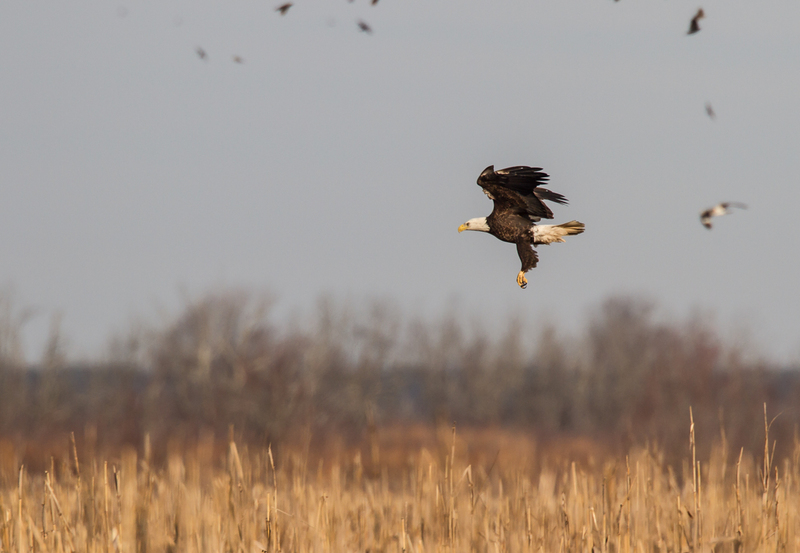 Finally, from behind the cloud of flapping white and black, a flapping black and white appeared – a Bald Eagle. The eagle cruised past the scattering Snow Geese and seemed intent on a particular spot on the ground in between the rows of standing corn. I had seen a few vultures in that area when I had walked by, and the eagle dropped down in the same area and disappeared behind the corn. Undoubtedly, the vultures and eagle had found a carcass of some sort. 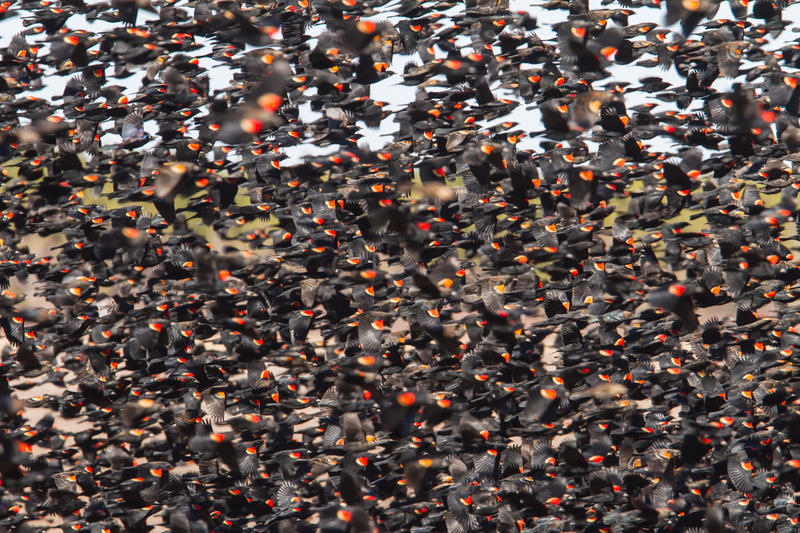 Now a new flock was added to the aerial commotion – Red-winged Blackbirds. The sky was soon a swirl of tiny black spots and noisy white blobs. 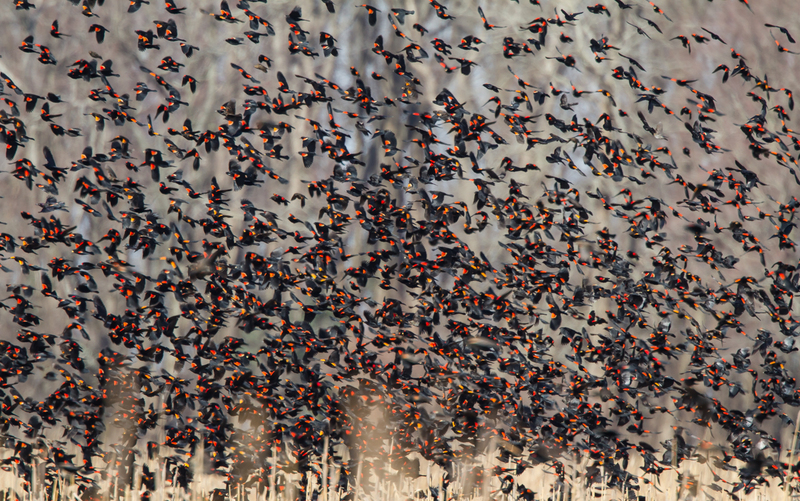 These huge flocks of Red-winged Blackbirds (and usually some other species mixed in) are one of my favorite things about Pungo in winter. 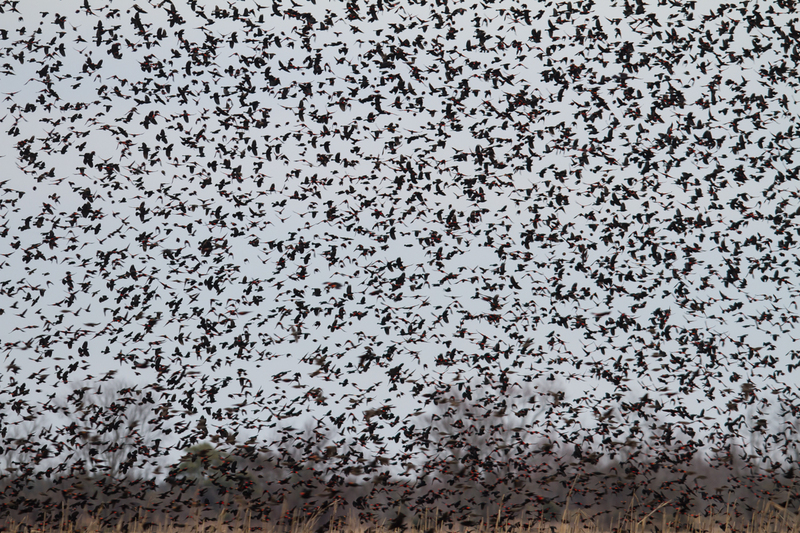 There were probably close to ten thousand birds sweeping across the corn, and flying to and from the trees. The sound was incredible. And every now and then a tornado of red wings erupted from the field. 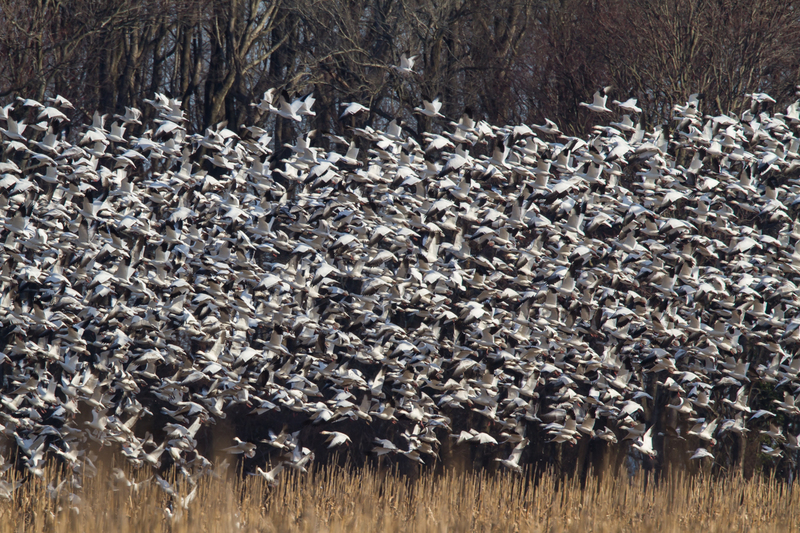 As with the Snow Geese, this was usually caused by an aerial predator. 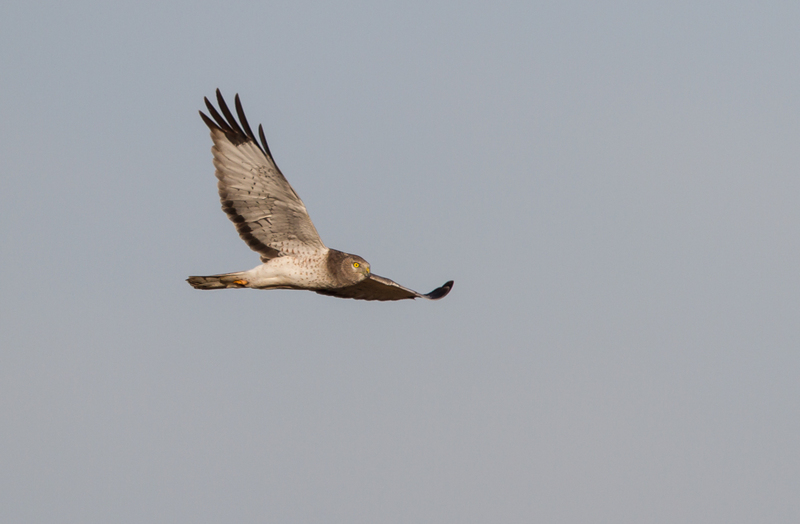 In the case of the blackbirds, it is often a Northern Harrier cruising the fields looking for a meal. I could see two of them canvassing the corn so I set up my tripod and waited, hoping for a passing shot, especially of the male I could see on the far side. I have tried to get an image of one of the ghostly gray adult males for several years but they have always eluded me. 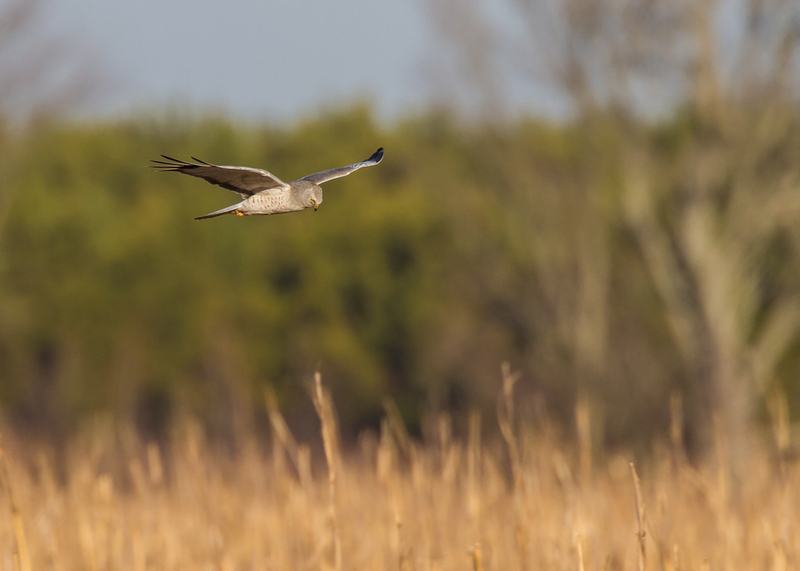 The male Northern Harrier finally sailed by my side of the field, gliding on his large wings, head down, looking for a bird or small mammal. He swung by close enough for a few good shots, the sunlight catching his contrasting feathers and highlighting his bright yellow eyes. I soon encountered the Black Bear and Raccoon from my previous post and spent a couple of hours watching things in the trees instead of the sky. But I finally I headed back out to the fields to see what was going on. There were several eagles perched in trees around the field edges. 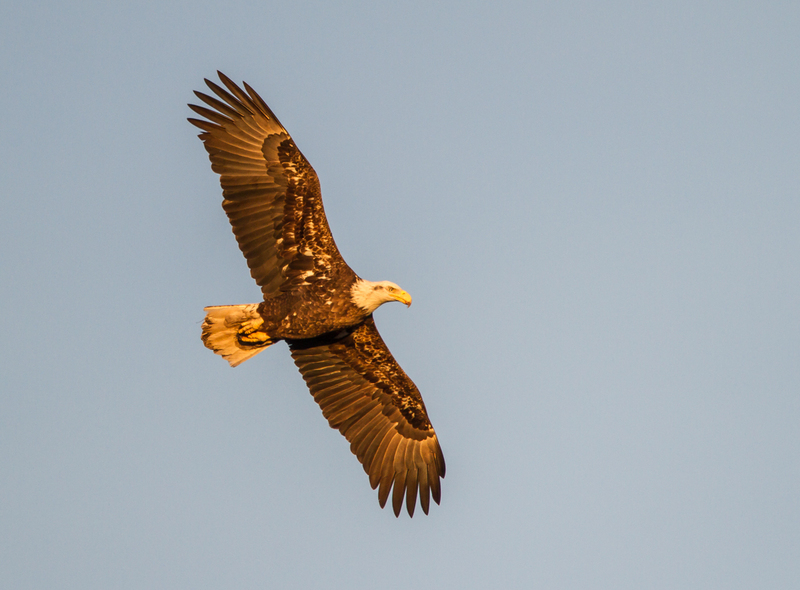 A couple of people were now walking on the road, and they spooked a couple of the eagles, one of which flew close by me for a nice look. 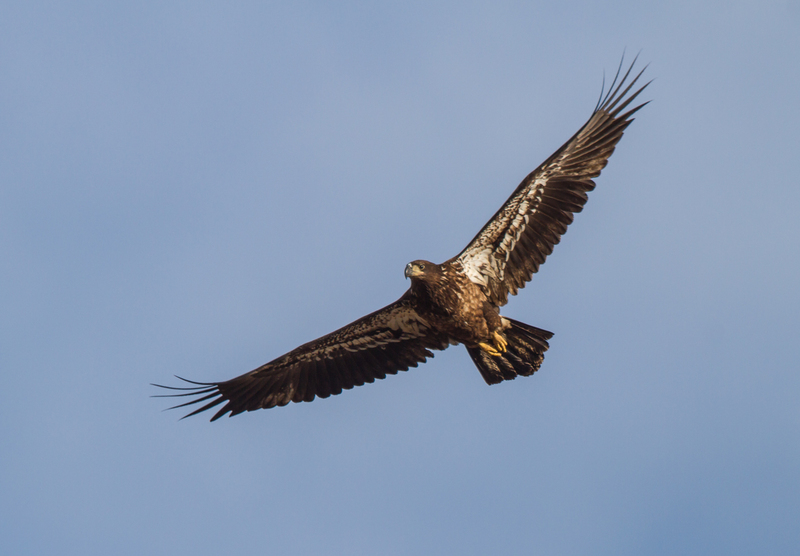 It was an immature Bald Eagle, recognized by the mottled whitish “arm pits” as it flew over my head. The light was getting beautiful, a golden glow from the low angle of the sun. I soon heard the loud, low whoosh made by the wings of the Snow Geese lifting off the lake. The show was about to begin. I could hear them coming and then the first of the birds flew over the tree tops, headed out to the corn. 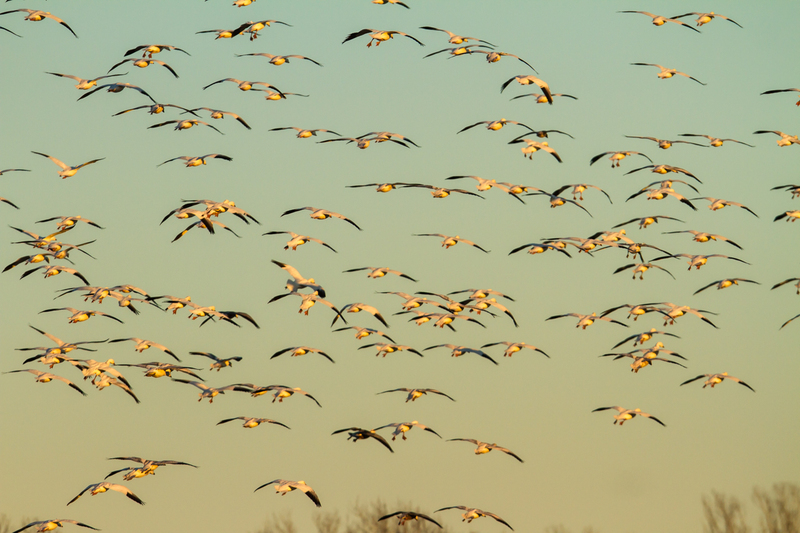 The light was gorgeous, turning the flock into a gilded swarm. The people on the road stopped to watch the birds fly overhead and then headed back down the path once the flock was across the field. I knew there were a couple of more eagles ahead of them and I figured these birds would soon fly, so I stepped up against a tree trunk to help hide my outline and waited, hoping one of the adult birds would fly by me. Sure enough, I saw the remaining two eagles head out over the field and one banked and headed my way. 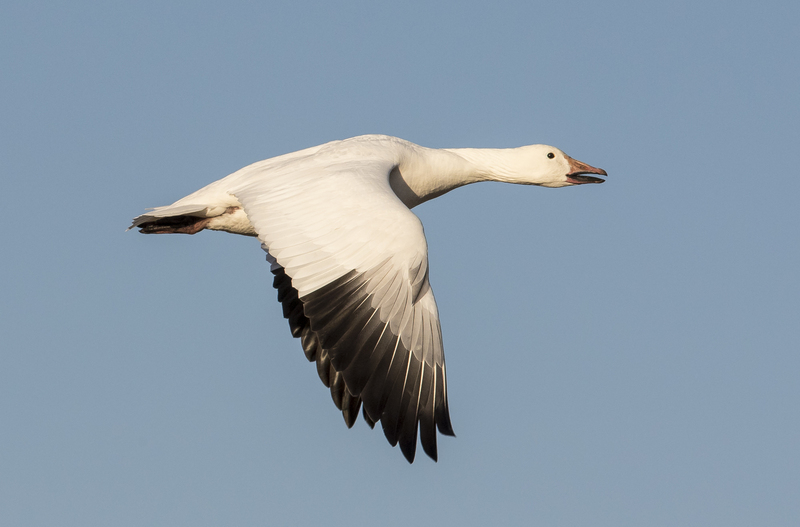 Then I heard more Snow Geese flying in from the lake. If only…. 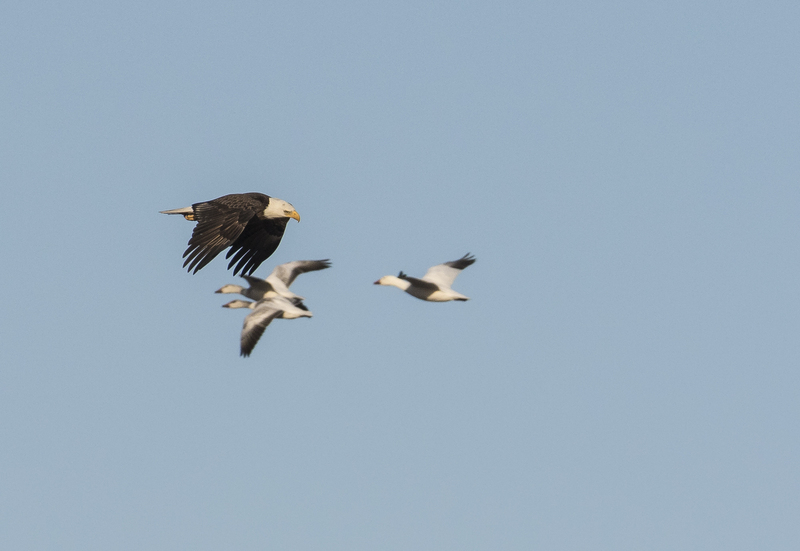 As luck would have it, the eagle circled back just in time for the Snow Geese to fly behind it, giving me a rare opportunity to see and photograph this spectacle three times in one day, predator and prey sharing the sky. But this light was by far the best of the day. 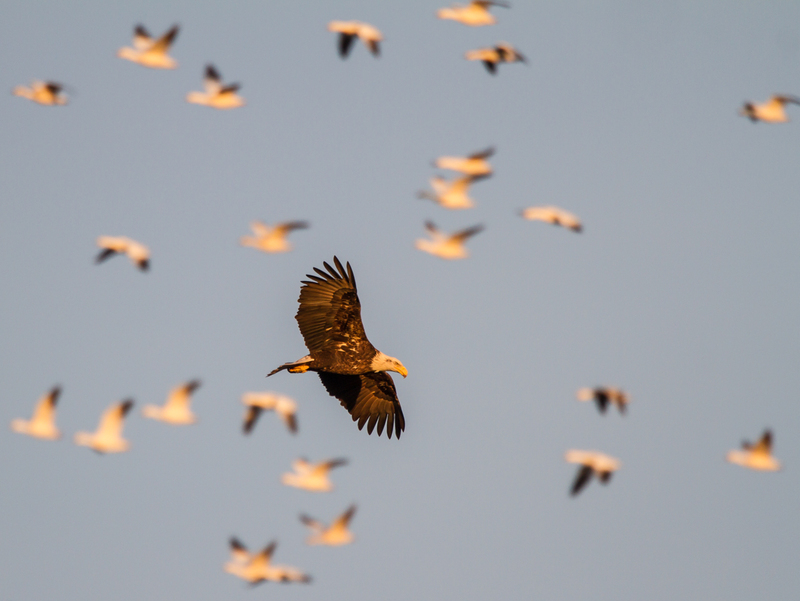 The eagle spotted me and flew out over the tree tops, leaving me to watch in awe as thousands of Snow Geese flew into the field for one last feeding before nightfall. and of harmony around us. I will carry this sense of harmony for a long time to come. 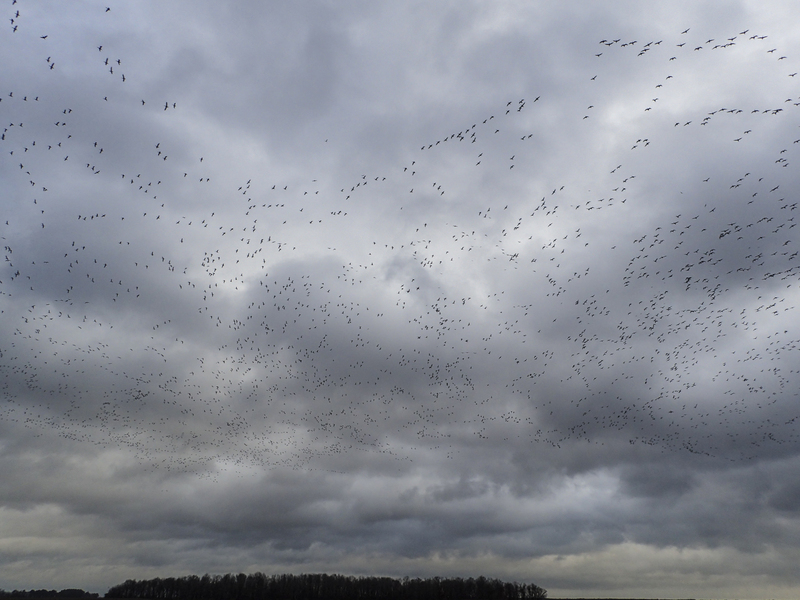 Watching huge flocks of Snow Geese swirl down from the sky, amid a cacophony of honking, is a little like standing inside a snow globe. When I saw this quote, I said, yup, they nailed it. 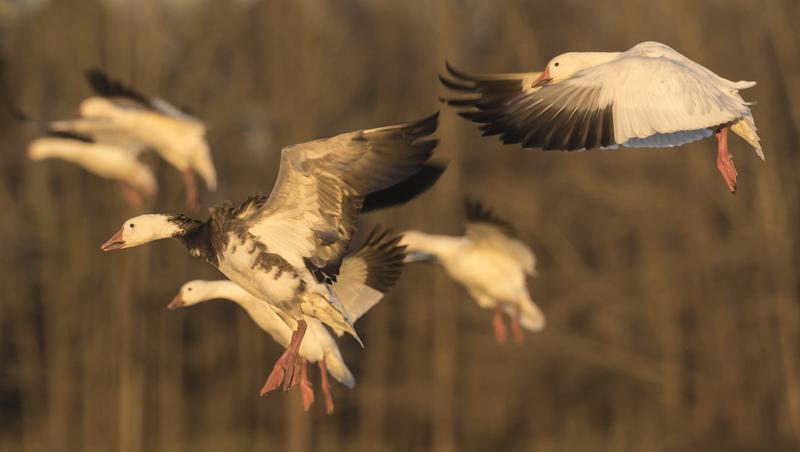 On almost any day from mid-December through early February, you have a good chance of seeing large flocks of Snow Geese as they fly to and from various roosting areas (usually Pungo Lake) and the fields where they feed. But what you want is to be standing next to the field they choose to land in, especially after sunrise or close to sunset. Then you have a chance to experience what I call, The Show. Last weekend I had two groups, one in the rain and clouds on Saturday, and one on a beautiful sunny day on Sunday. 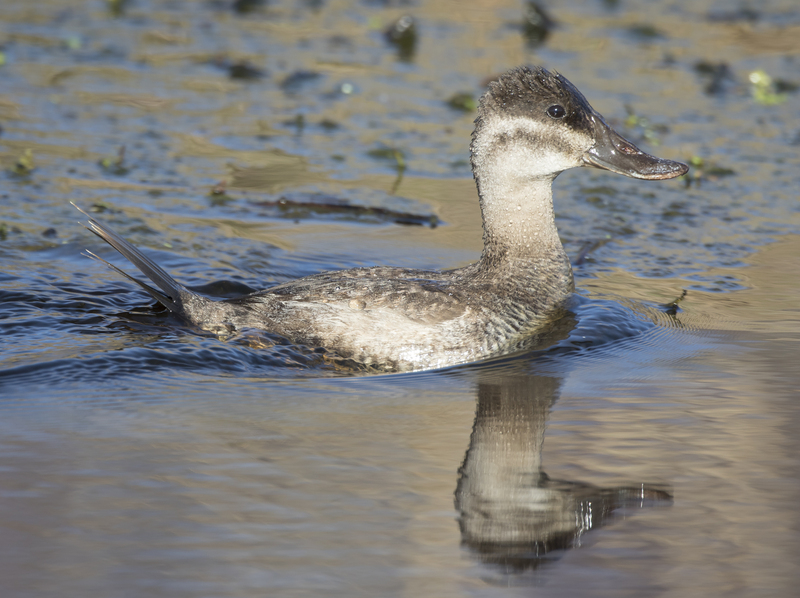 It truly was weather fit for ducks on Saturday, and, true to its name, the birds were very active all day. Based on the number of gunshots heard just off the refuge, the local hunters were having a good day as well. 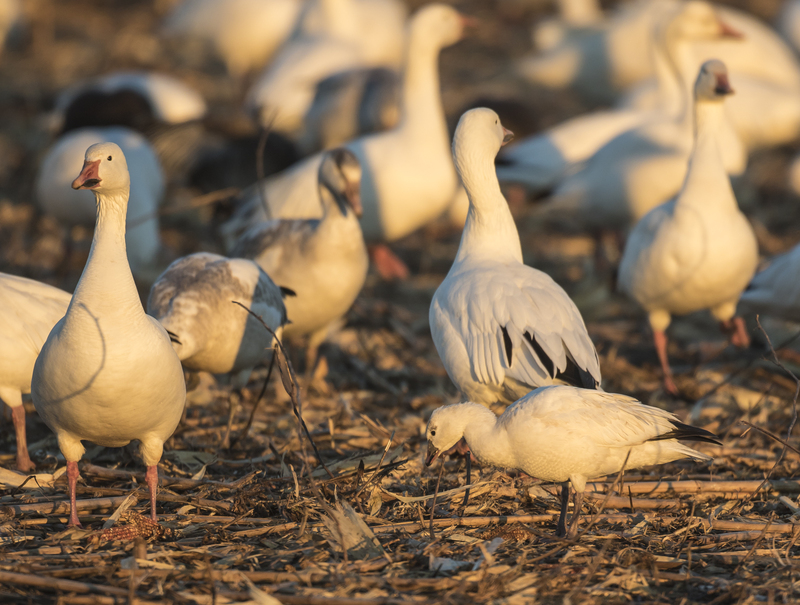 The Snow Geese came in to a field later than usual that morning and stayed a long time before heading back to the lake. 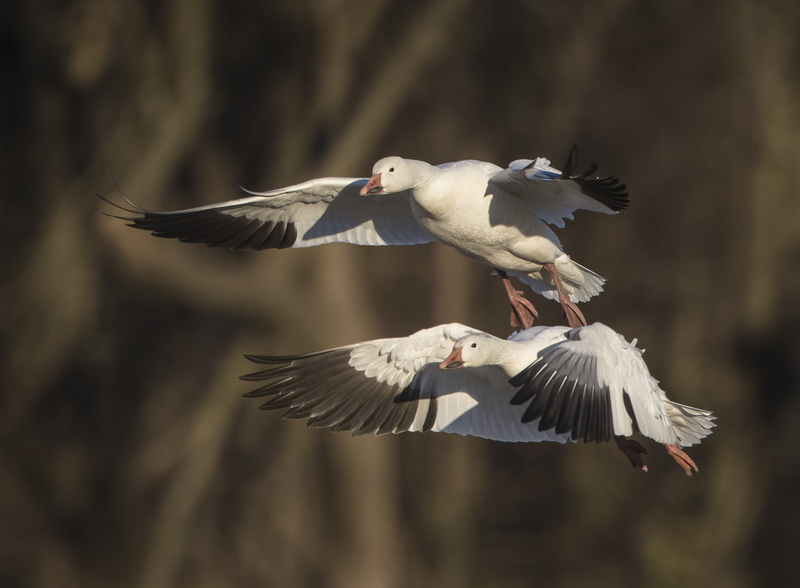 Sunday was very different – after an early morning departure, the Snow Geese returned after about an hour and spent much of the day on the lake. 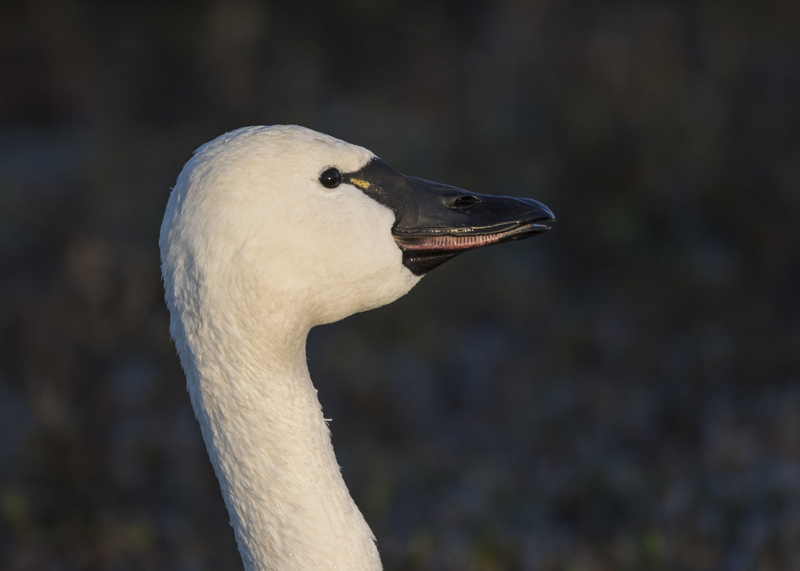 The swans, meanwhile, took their time getting out to the fields to feed, and by late afternoon when we returned from Mattamuskeet, there were a few thousand Tundra Swans in some corn fields near one of the refuge roads. This is always a good sign. Snow Geese seem to like to land in fields where there are a lot of swans feeding, but this was not the field they had been in the evening before. 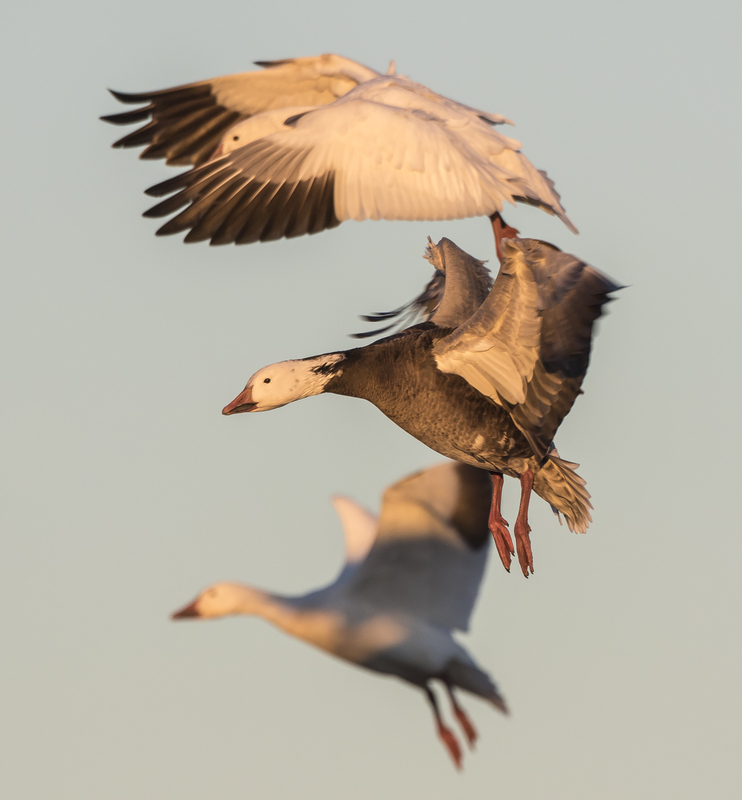 It has been a little harder this year to predict where The Show will be as the fickle Snow Geese have been splitting up in smaller flocks and moving around a lot more than in years past. But, as we watched the swans, I saw the thin, wavy lines of Snow Geese on the horizon. So, we waited. After circling a bit over the lake, it looked as though they were headed our way. 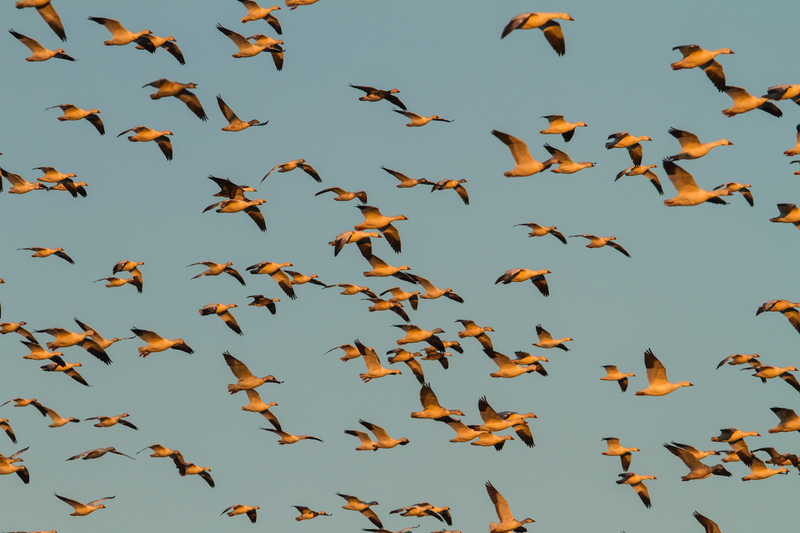 As we watched, the leading edge of the flock streamed our way and started to circle the field, the late afternoon light casting a golden glow on the underside of the birds. 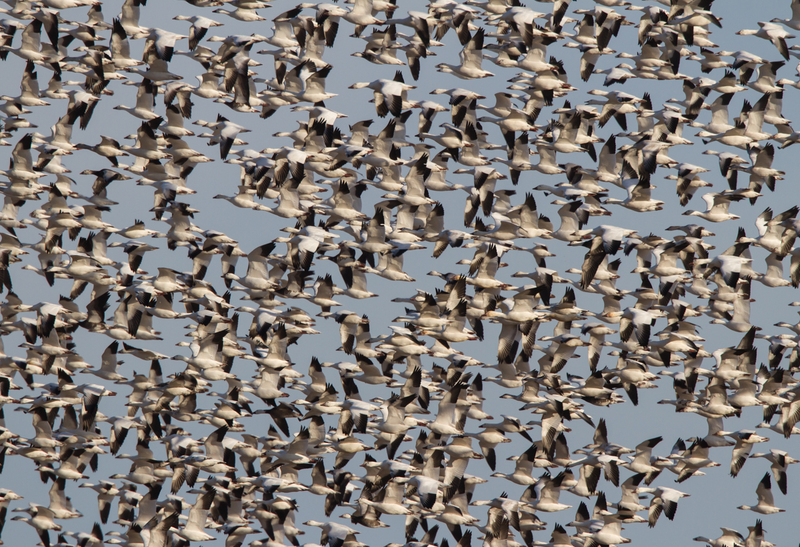 Looking back at the horizon, I could see thousands of Snow Geese headed our way, and we seemed to be in just the right place….let The Show begin. For the next 30 minutes, we stood there, mesmerized by thousands of birds flying around us and feeding in the field right next to the road. Every now and then a car would drive by, pushing the birds farther back into the field or causing large numbers to lift off and circle over us again before settling back down to their dinner of corn kernels. Can you spot the Ross’s Goose in the flock? I wanted the group to see some of the smaller Ross’s Geese and we soon found several on the front edge of the flock in the field next to us. 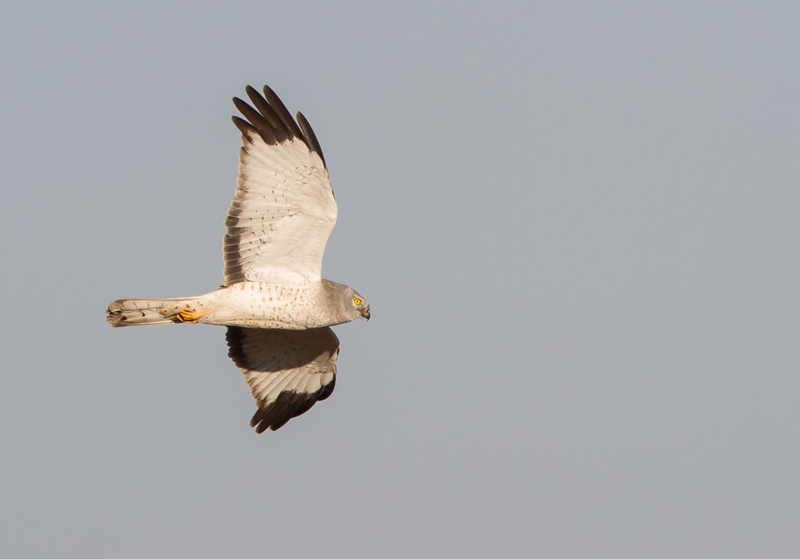 We also tried to spot their smaller size in the birds flying low over our heads. Look at the photo above (best to click on it and enlarge) and see if you can find at least one Ross’s Goose – it is smaller in size, lacking the “black grin lines” found on a Snow Goose bill, and has a shorter, stubbier bill. As darkness approached, small groups of Snow Geese began to head back to the lake along with an increasingly steady stream of swans. 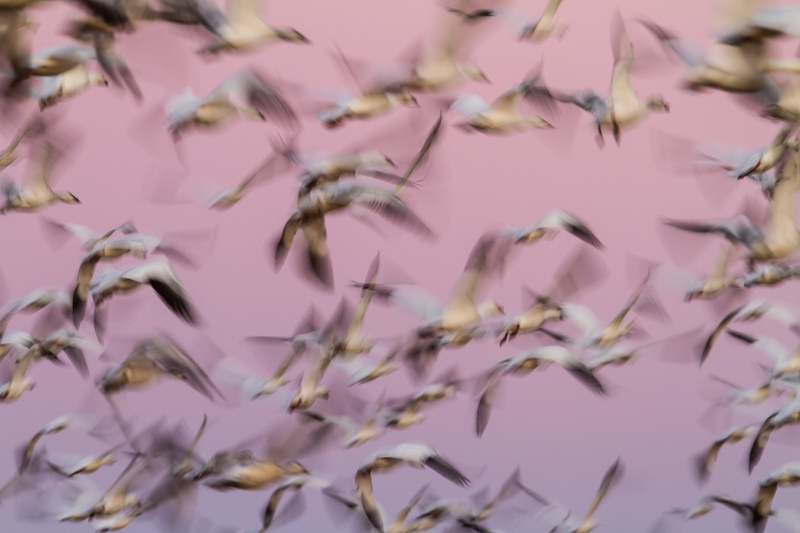 Finally, a car came by with its headlights on, and the rest of the Snow Geese blasted off in a blur of wings. 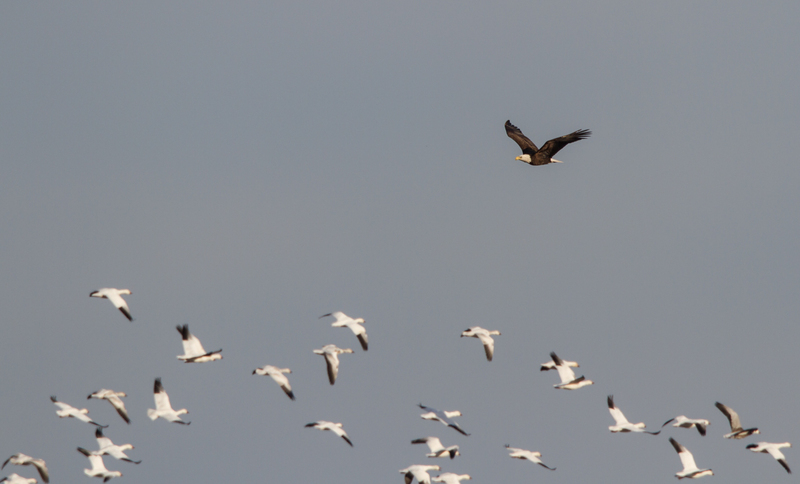 It had been a phenomenal afternoon and The Show had been superb, with thousands of birds right on top of us. There really is nothing else like it anywhere in our region. 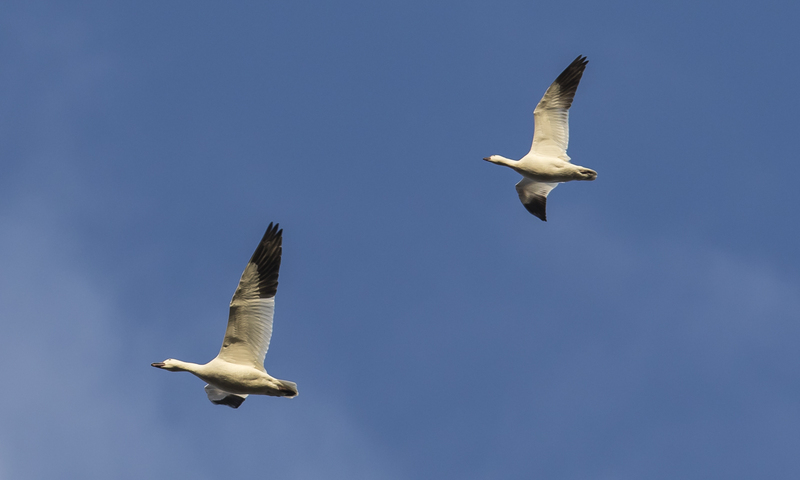 The Snow Geese should be around a couple of more weeks before they start their long migration back to their breeding areas. 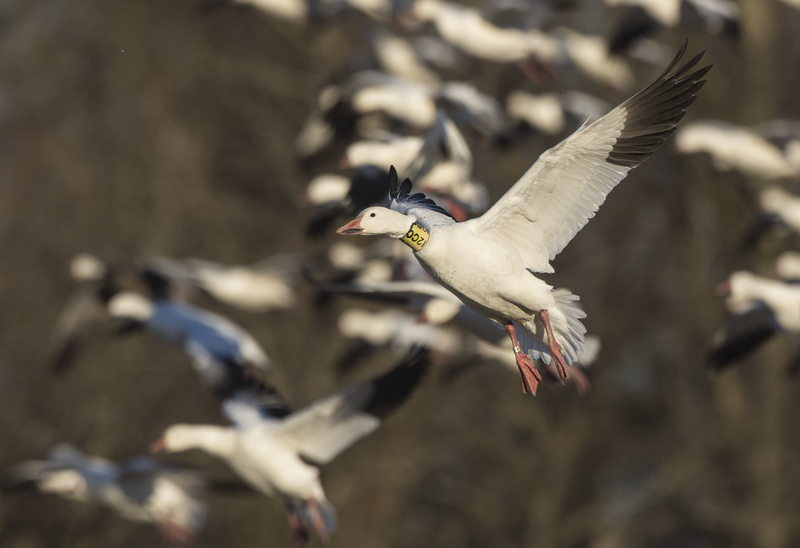 One Snow Goose we reported this year had a neck collar with the code TC84. We heard back from a USFWS biologist that it was banded on its breeding area on 8/15/2011 at the South Plain of Bylot Island, Nunavut, Canada…a long way from this corn field in eastern North Carolina. 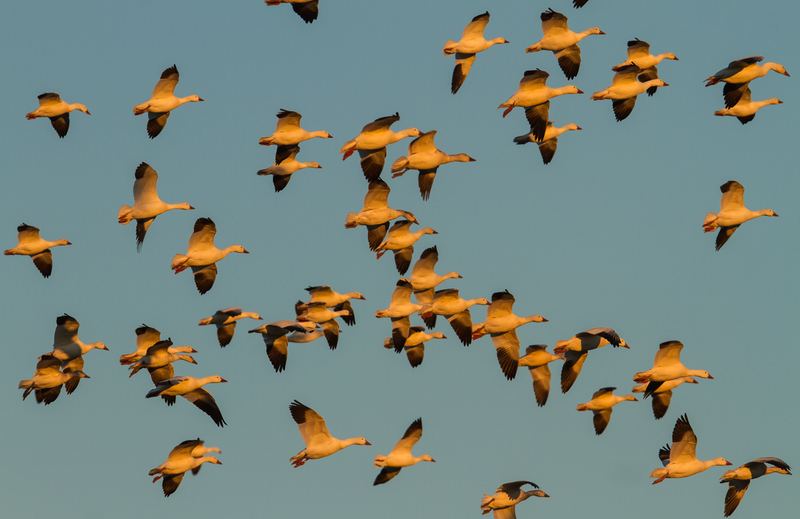 Hundreds of these geese flying together really convey why their name is so appropriate – they look like a flurry of snowflakes. But they’re very noisy snowflakes; the sound that these flocks make is an experience in itself. 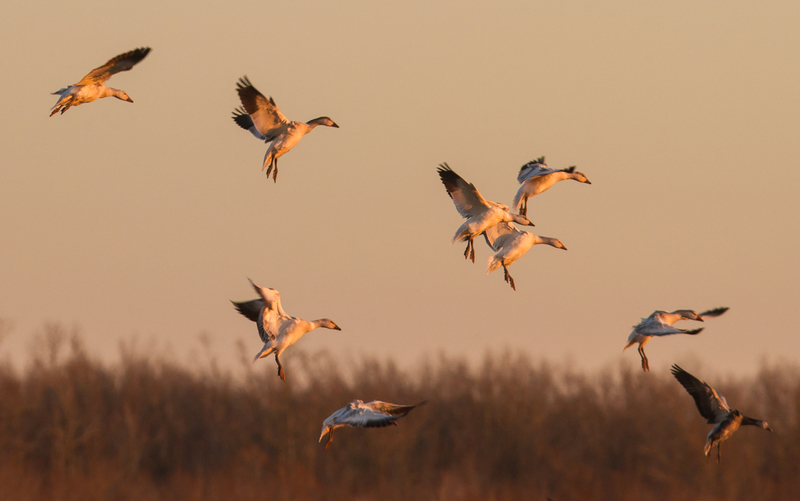 A huge flight of Snow Geese is something that everyone should see (and hear) at least once in their lifetime. Well said, Chris. I couldn’t agree more. I just let it run while my senses tried to take it all in as they were put in order. Plans to protect air and water, wilderness and wildlife, are, in fact, plans to protect man. I had a group tour the first few days of 2015, so I went down to Pungo on New Year’s Day to scout things out. It was a cold and beautiful afternoon. 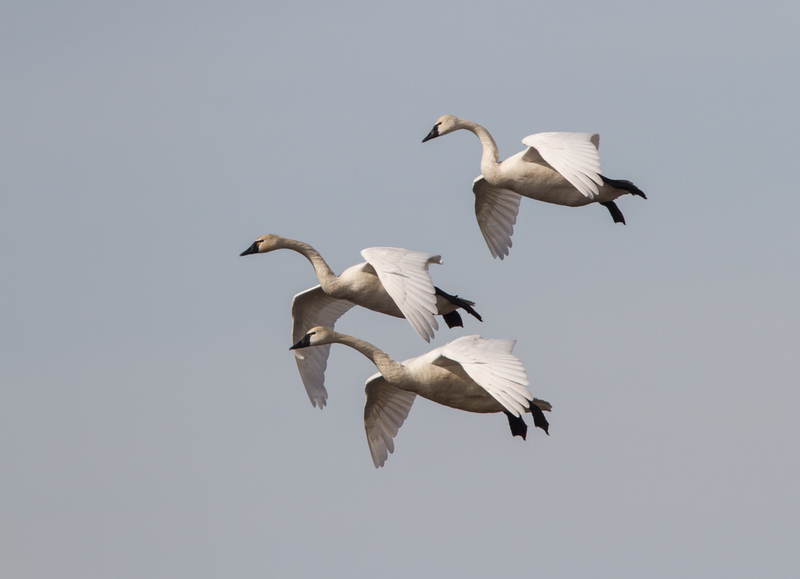 The usual groups of Tundra Swans dotted the fields and there were a few small flocks of the increasingly elusive Snow Geese flying to and fro. 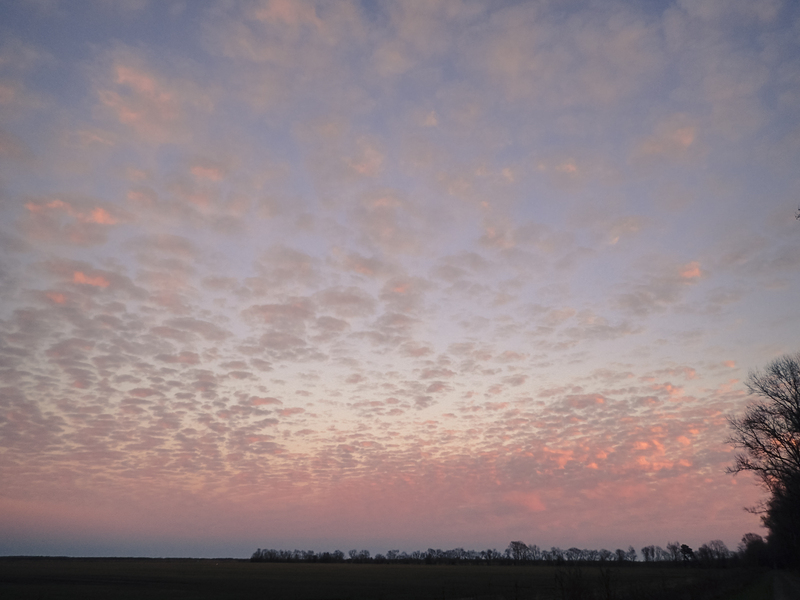 As the sun started getting low in the sky, I drove over to the south shore of Pungo Lake, hoping to catch the geese coming back in to roost for the evening. Instead, I spotted their characteristic undulating waves of birds flying high over the lake, as if headed out to the fields to feed. I jumped in the car and drove out toward the refuge entrance in case they were headed to the corn fields for a late snack. When I arrived, most of the geese were feeding in a wheat field several hundred yards from my position. I could see a half dozen cars of folks close to the birds, but I wanted the geese against the orange sky, so I stayed put, on the far side of all the action. As the sun sank low in the sky, the geese continued to circle and land on the far side of the fields, giving me those silhouette images that I sought. Suddenly, the entire flock blasted off, presumably headed to the lake for the night. Instead, the mass of birds headed across the fields and swirled all around me, filling the sky with sound and the dark shadows of beating wings. Then, the entire flock landed in a corn field near the car. The sound of that many birds feeding in a field next to you is unbelievable. It sounds like a giant machine of some sort, perhaps a huge industrial furnace. 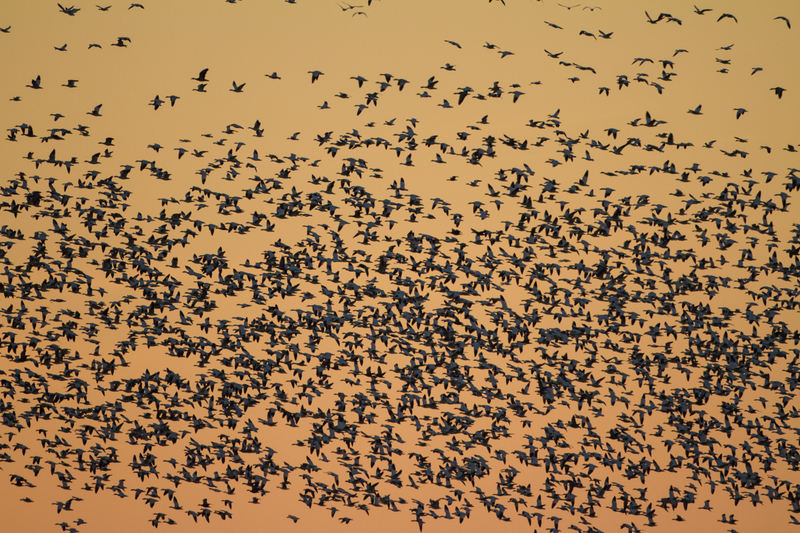 The flock, perhaps numbering 10,000 birds, moved through the corn like a feathered combine. I just sat and watched, in awe, at the spectacle of so many living things acting as one unified eating machine. 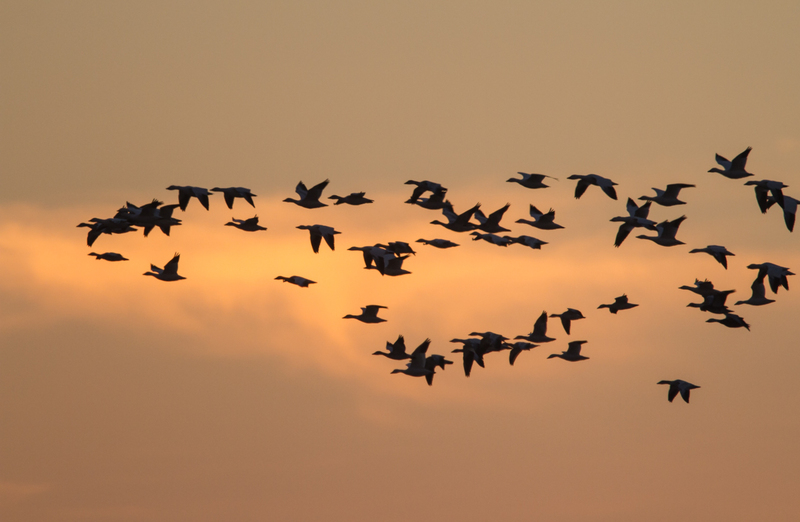 Suddenly, as if one of the birds had realized it was getting late, the flock erupted from the field, turned, and headed toward the lake for the night. I stood there for a moment as the sound faded to the north. What a magical way to start a new year.